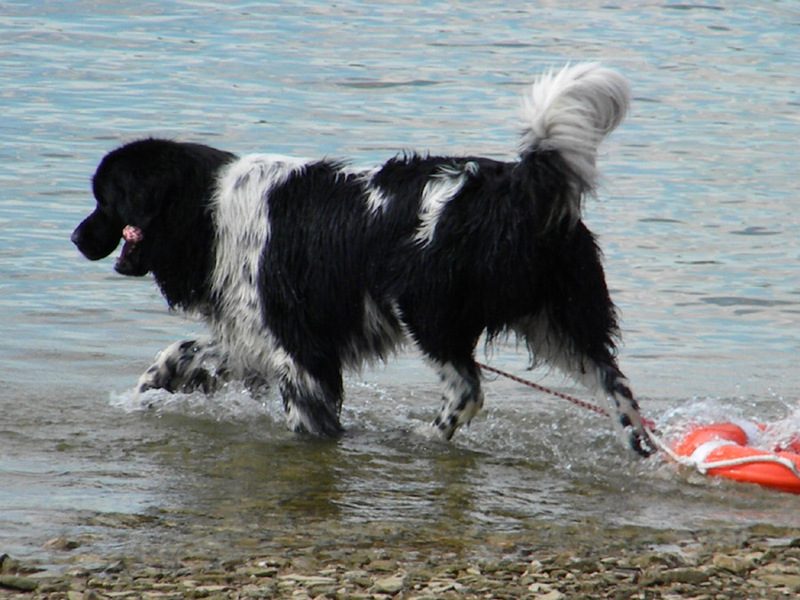 Newfs are big, slobbery (no Newf "parent" is ever seen without a drool towel), hairy, water and mud loving, loyal, even tempered souls who live to guard their fragile humans. 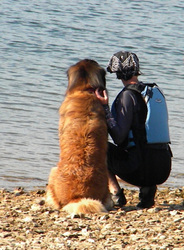 They have the cuddliness of your favorite teddy bear ( a fair number are named "Baloo" after the bear of the Jungle Books), the shedding factor of a pack of Siberians, a size that intimidates all Evil Doers, the soulful eyes of a basset hound, and they whine and worry if you go too far off the deep end. Then they will leap in after you and drag you back to solid ground. 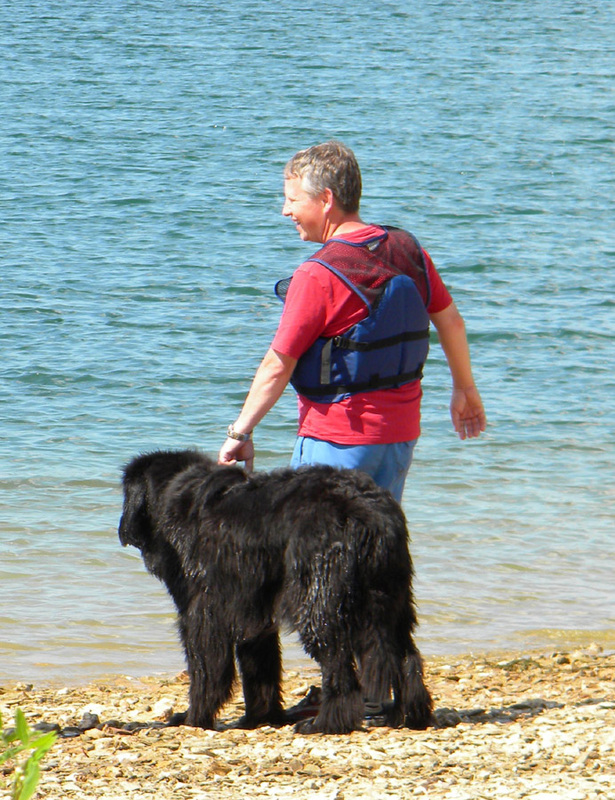 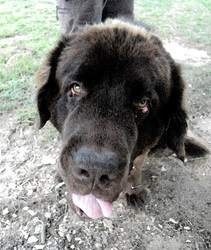 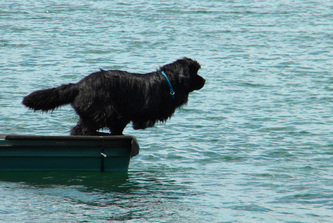 The above poem is perhaps the best known tribute to the soul of the Newf, or any dog. 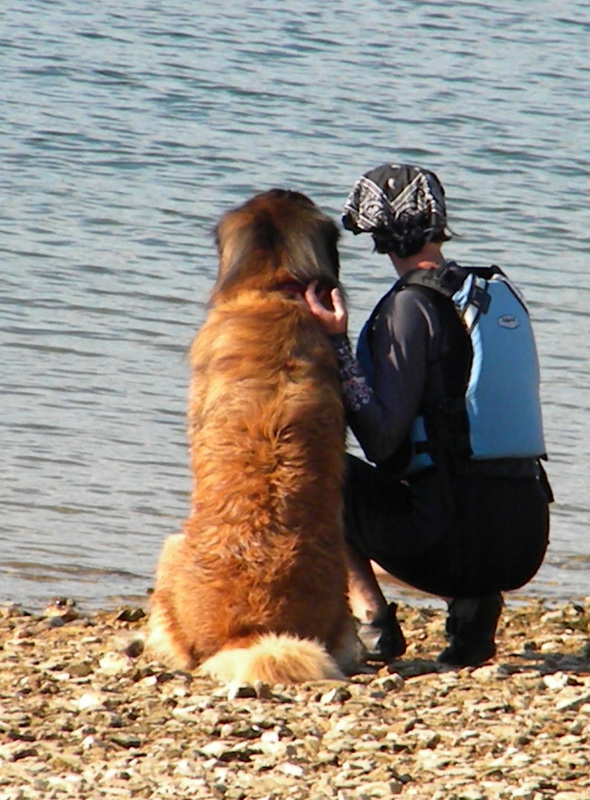 They are definitely not for everyone. 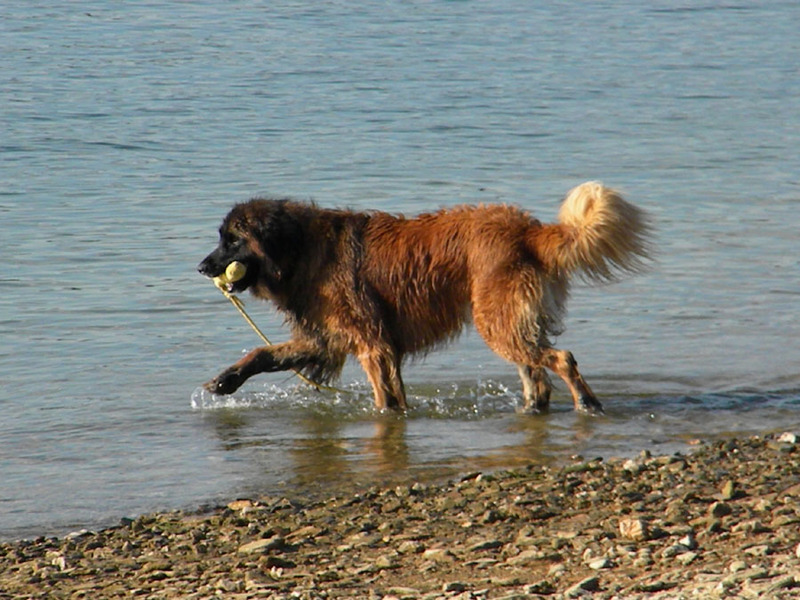 They are large, drooly, hairy, shed, and drag in mud, and anything else that sticks to lots of long flowing fur. They require air conditioning in hot climes. 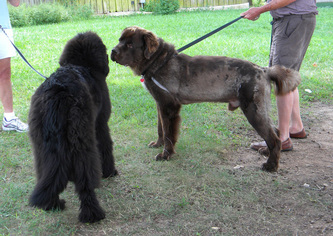 And grooming. And because of their size they can be prone to bloat, hip displasia and shorter lives than small yappy dogs. Their virtues, however, are legion; they are Nana, the nursery guardian of Peter Pan, they have been seacoast working dogs, dragging nets, retrieving dropped gear, rescuing drowning swimmers, swimming lines to sinking ships to rescue passengers and crew, and jumping out of helicopters on rescue missions. They have been service dogs, agility champs, carters, mushers... but what they excel at is water. 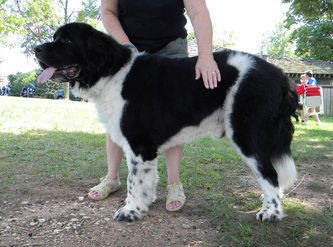 Newfoundlands can be black, brown, or black and white (Landseer, named after the painter who portrayed so many of this color pattern: the Landseer has ticking in the white bits), or "blue" (the sort of blue-grey steel color in which every hair is grey, not a mix of black and white hairs). They were originally bred and used as a working dog for fishermen in Newfoundland, Canada. 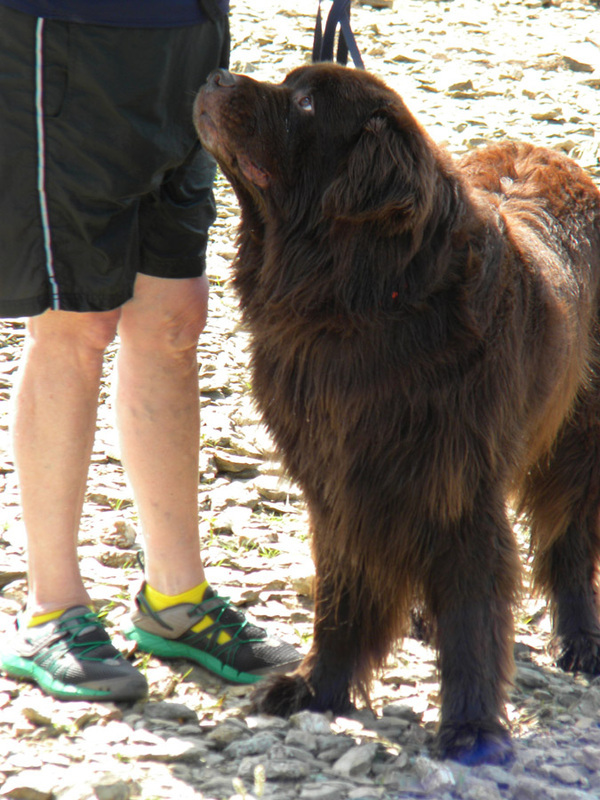 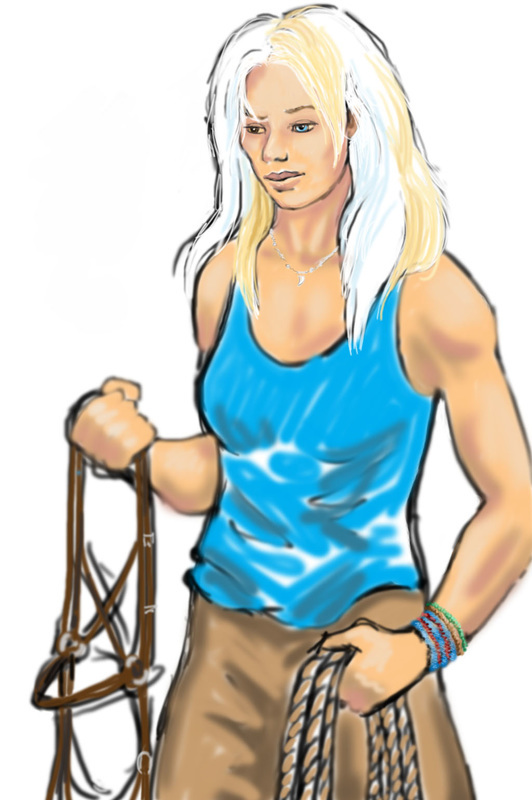 They are known for their giant size, tremendous strength, calm dispositions, and loyalty. 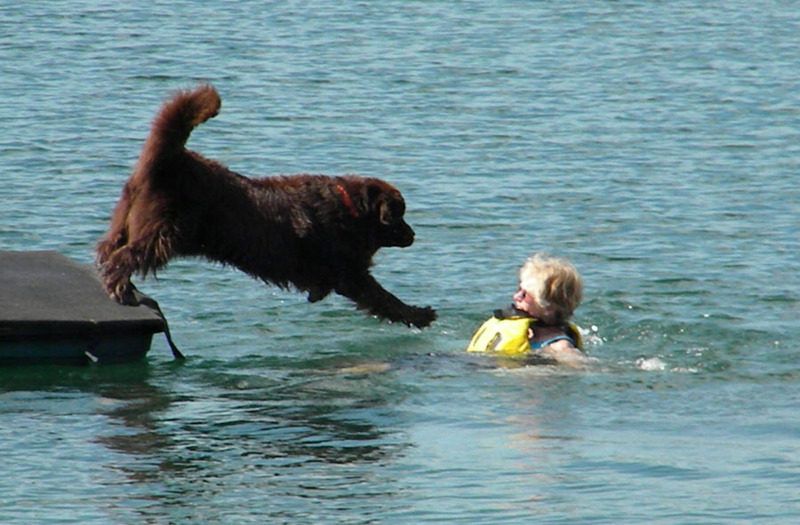 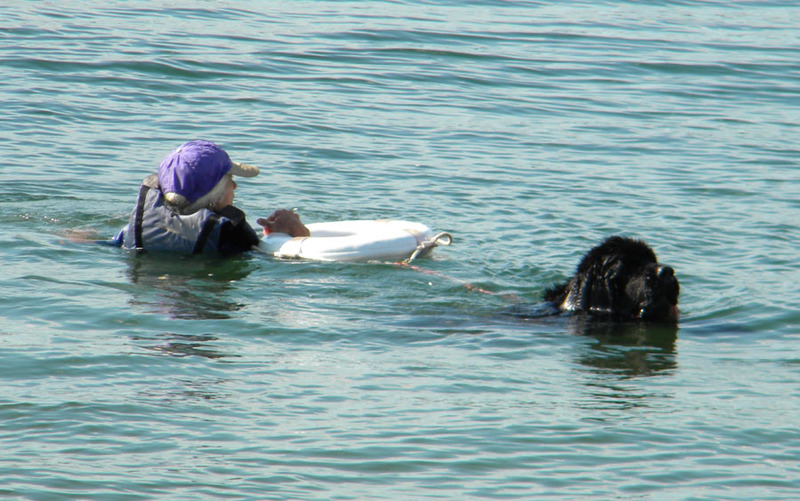 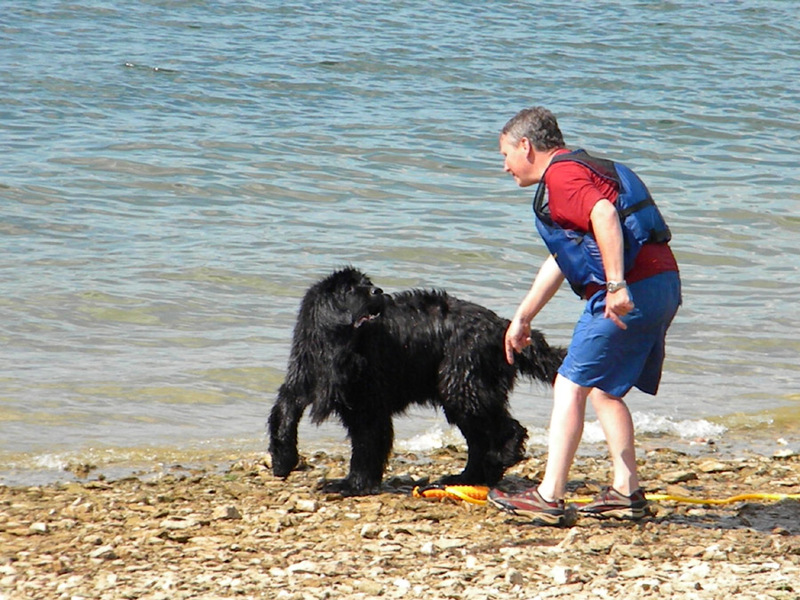 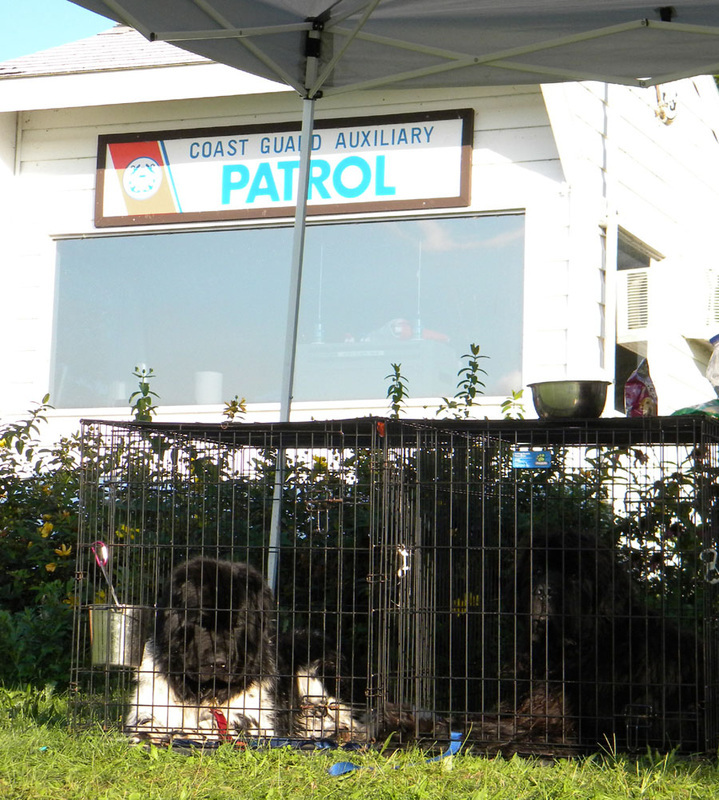 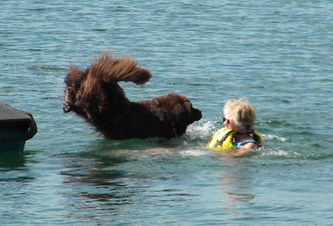 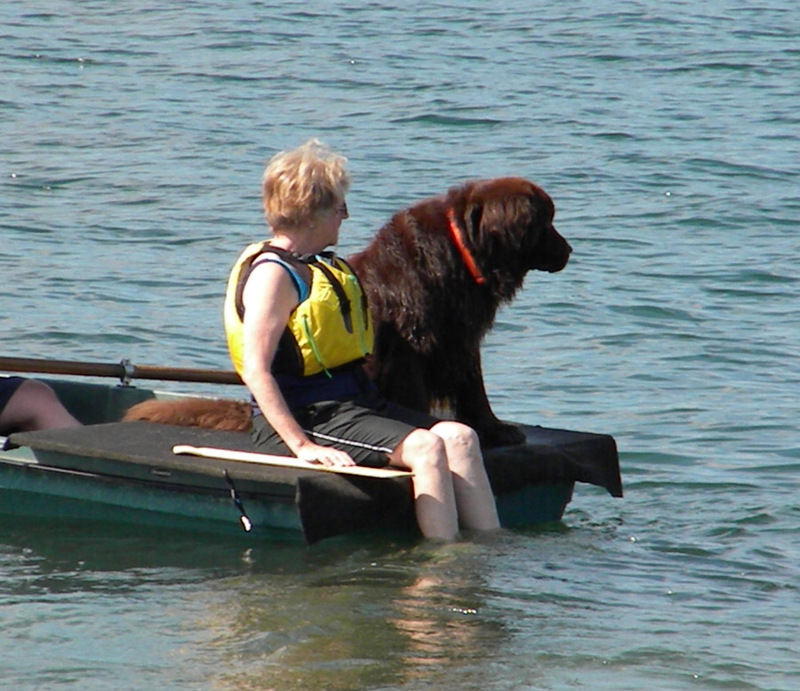 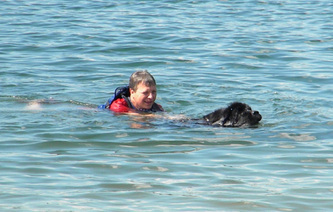 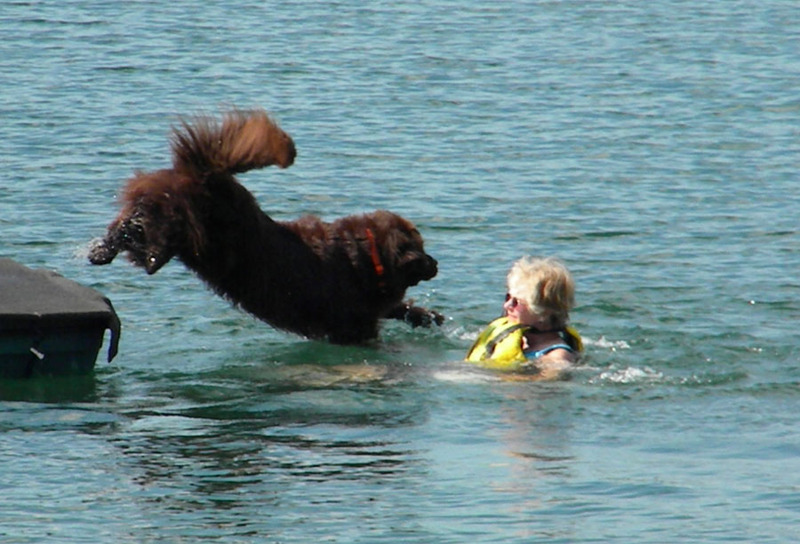 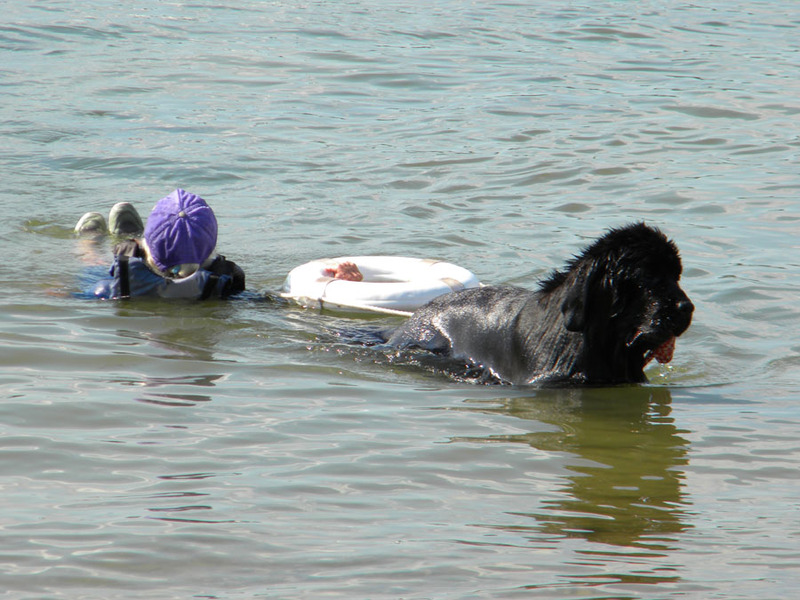 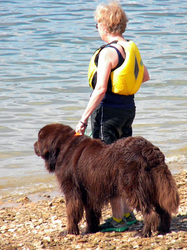 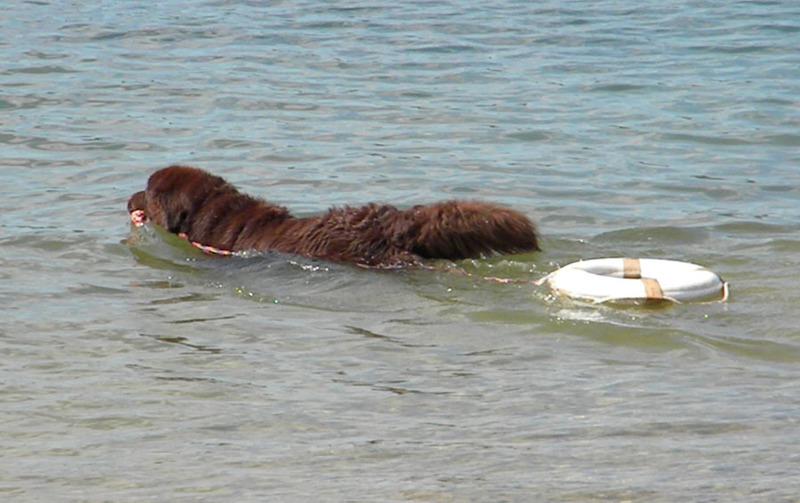 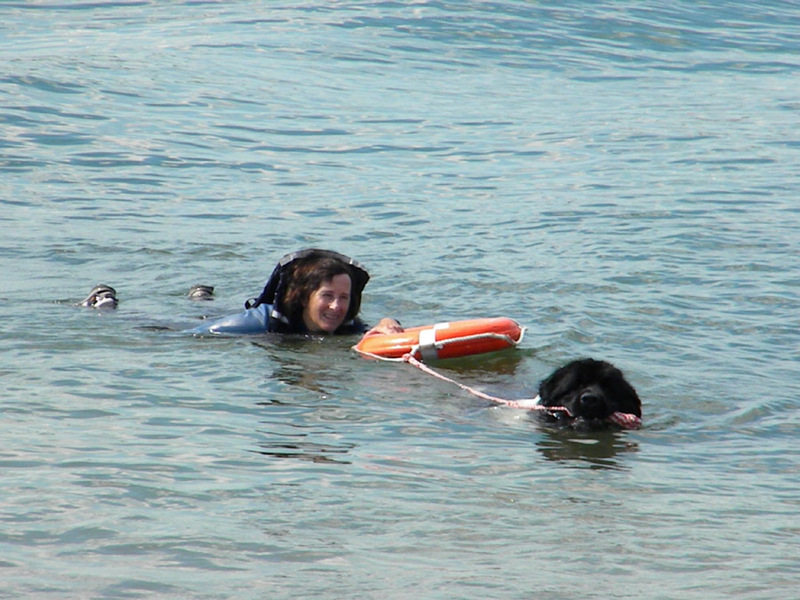 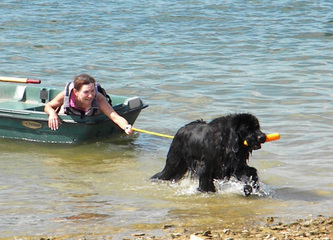 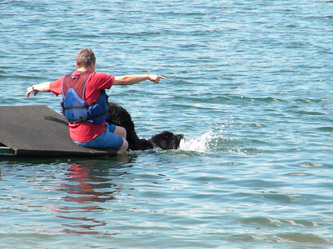 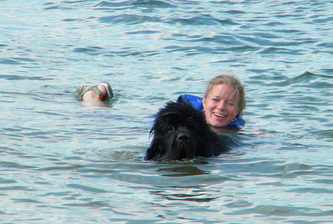 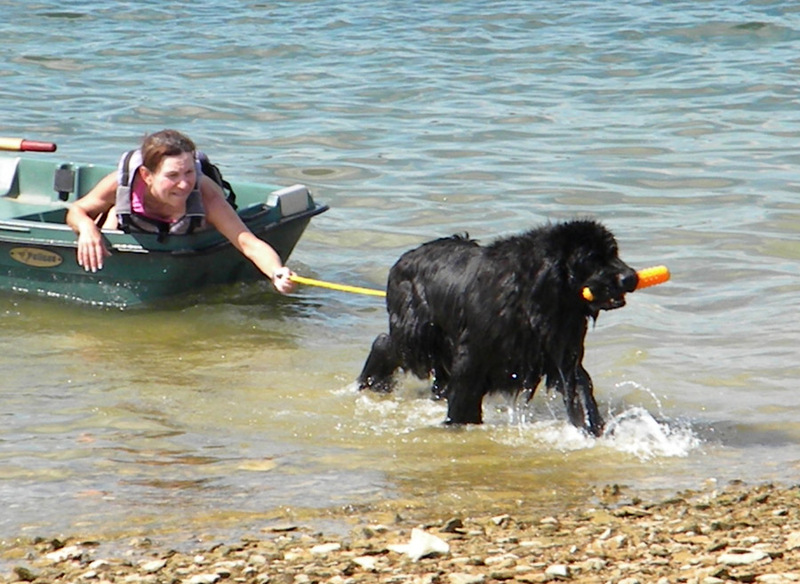 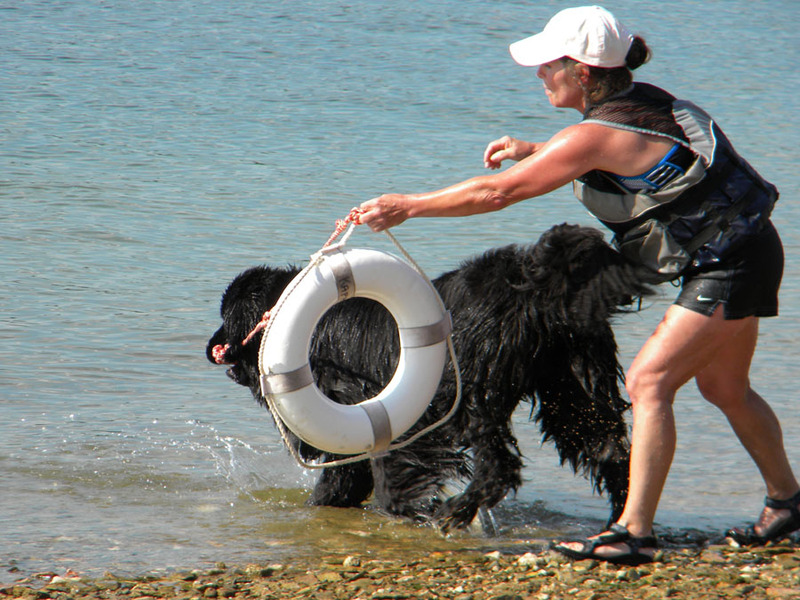 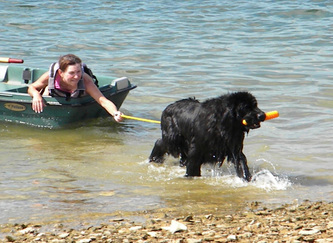 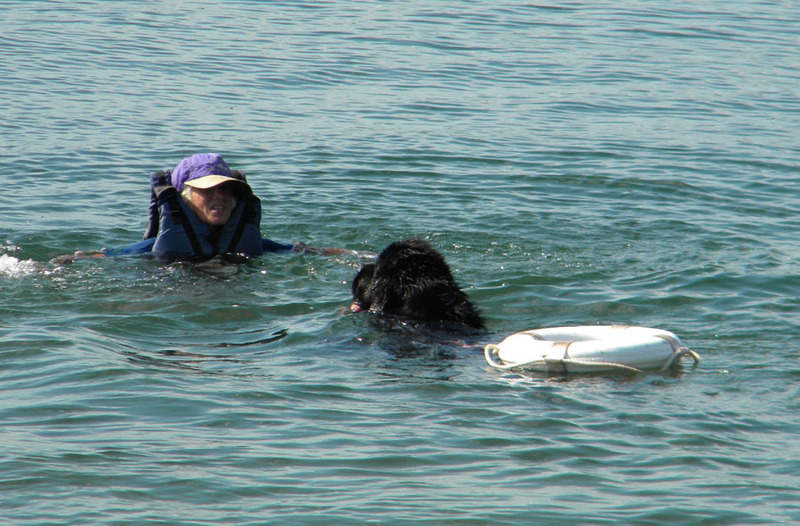 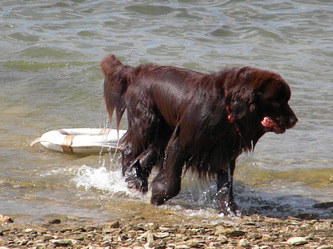 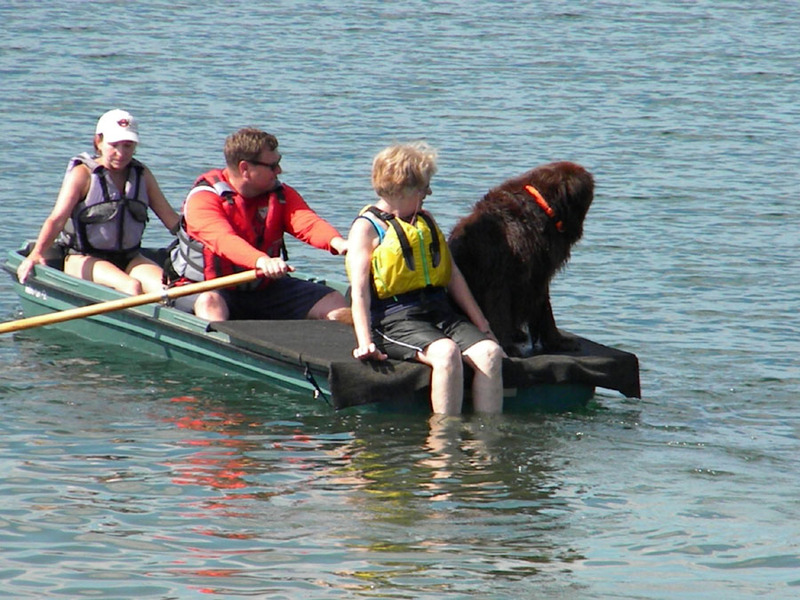 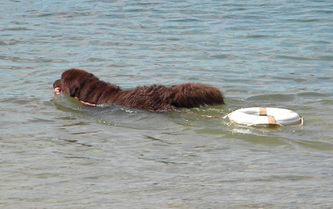 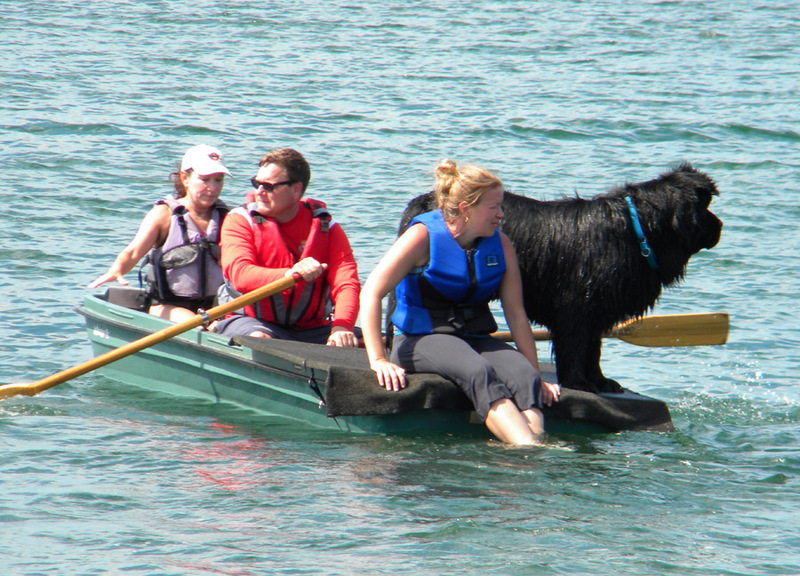 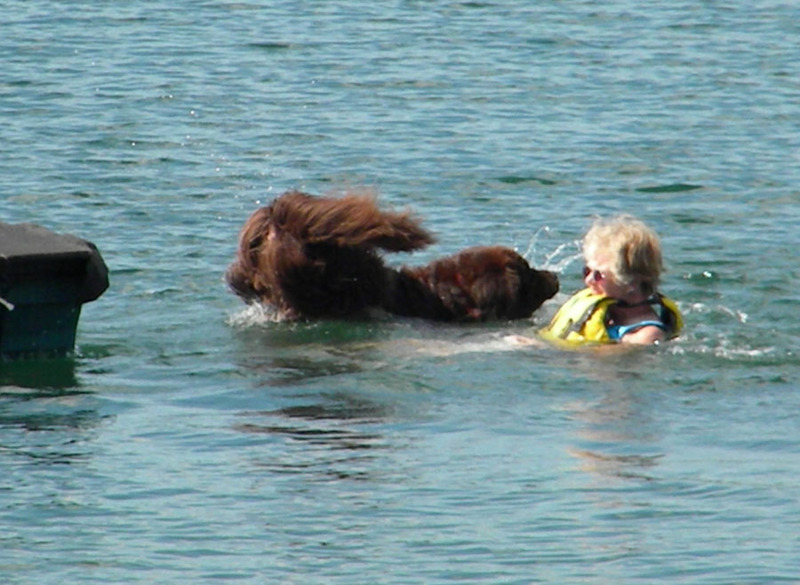 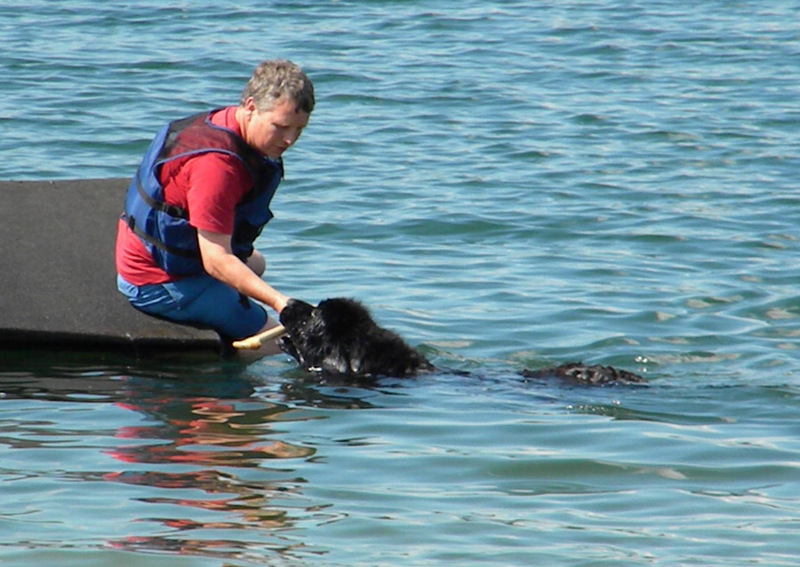 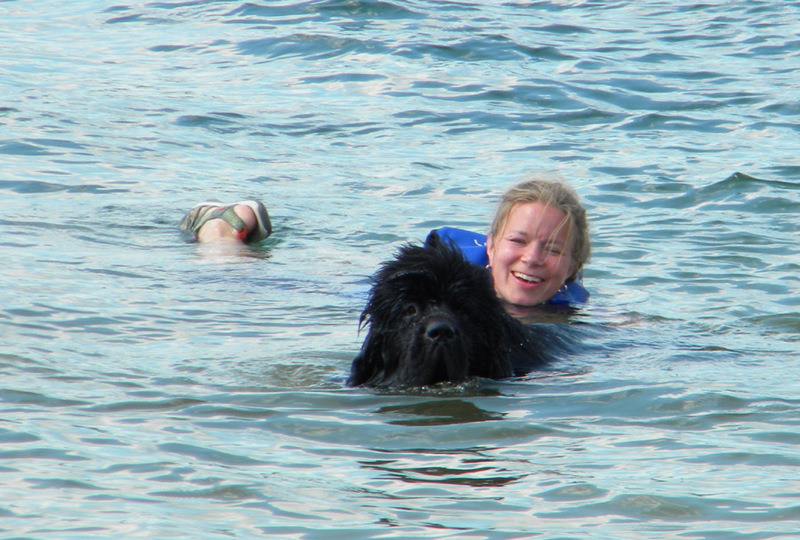 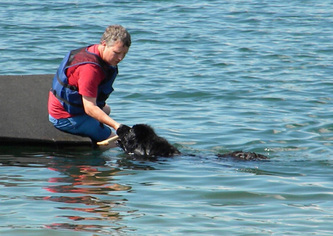 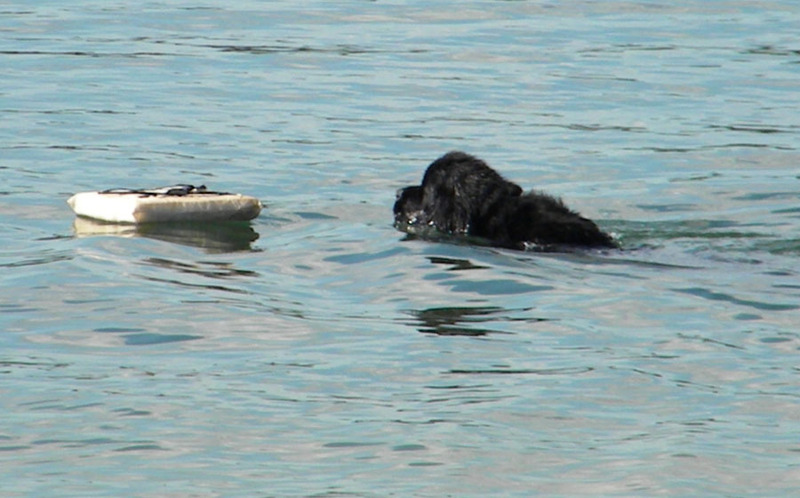 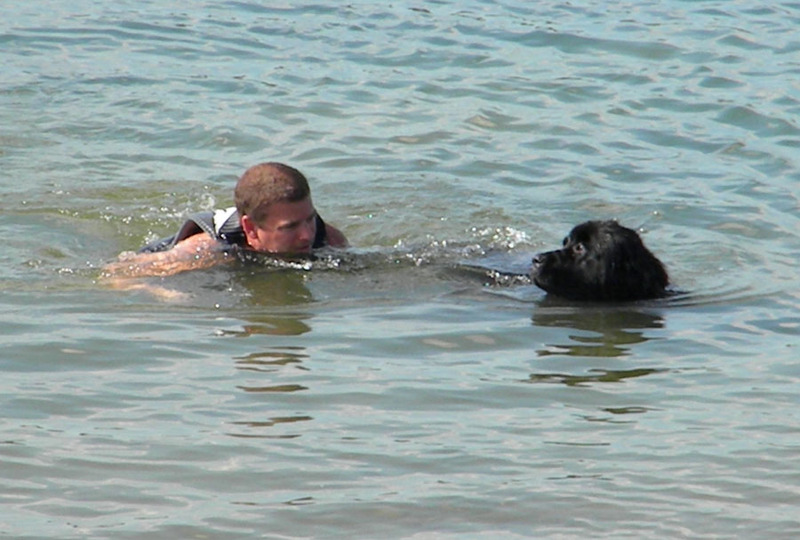 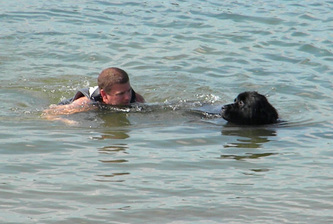 Newfoundland dogs excel at water rescue/lifesaving because of their muscular build, thick double coat, webbed feet, and innate swimming abilities. 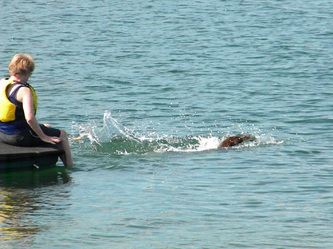 There is some debate among doglovers about webbed feet: one scientific source I tripped over (in pursuit of the doglike thylacine) pointed out that canines have somewhat webbed feet because they are a running animal (pursuing game) while the thylacine (a doglike marsupial) does not, as it hunted its prey by stalking, more like a cat. 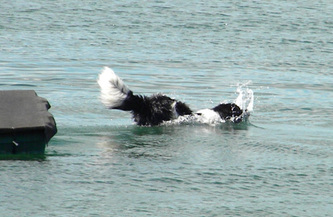 Of course my cat has slightly webbed feet too. 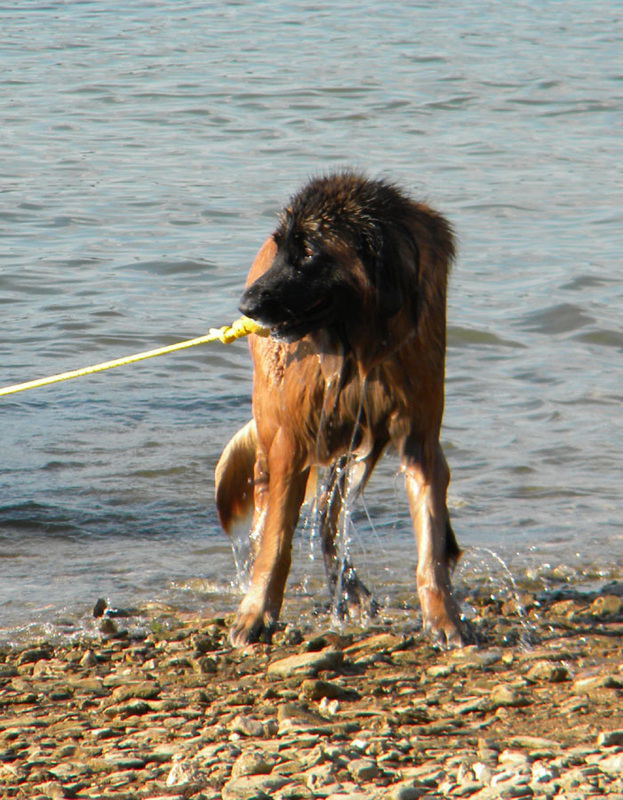 Point being, breeds that dealt with water (or frozen water, ie: snow) have feet that are markedly MORE webbed than ordinary dogs. 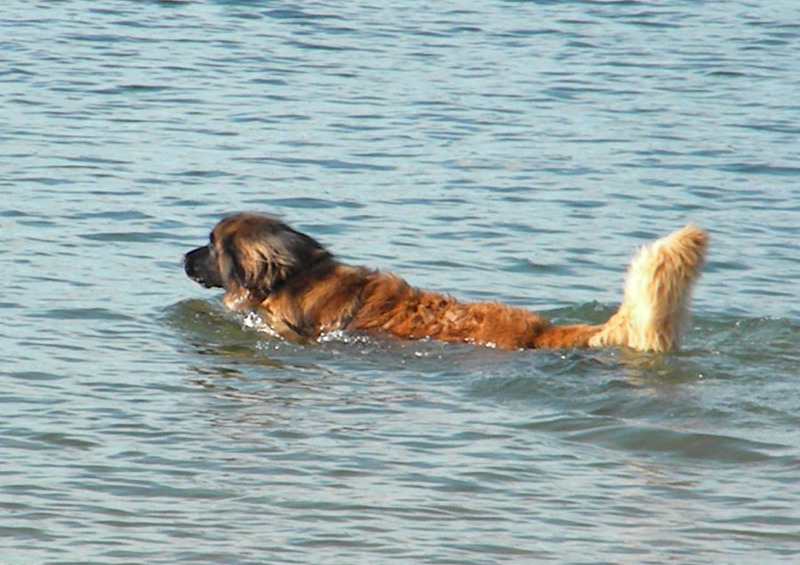 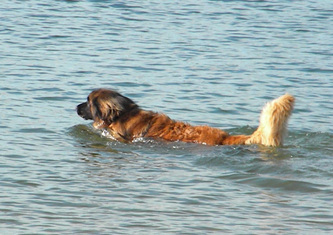 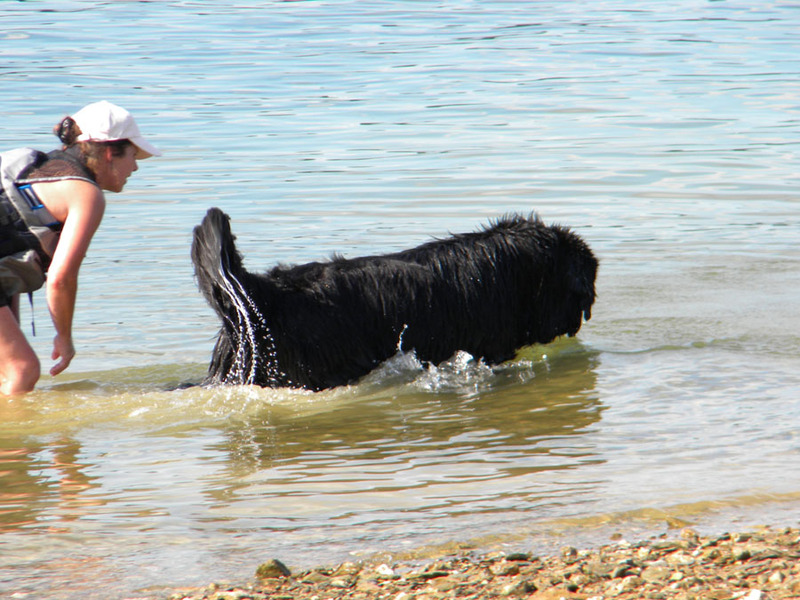 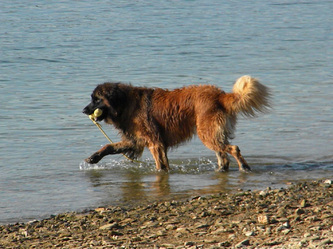 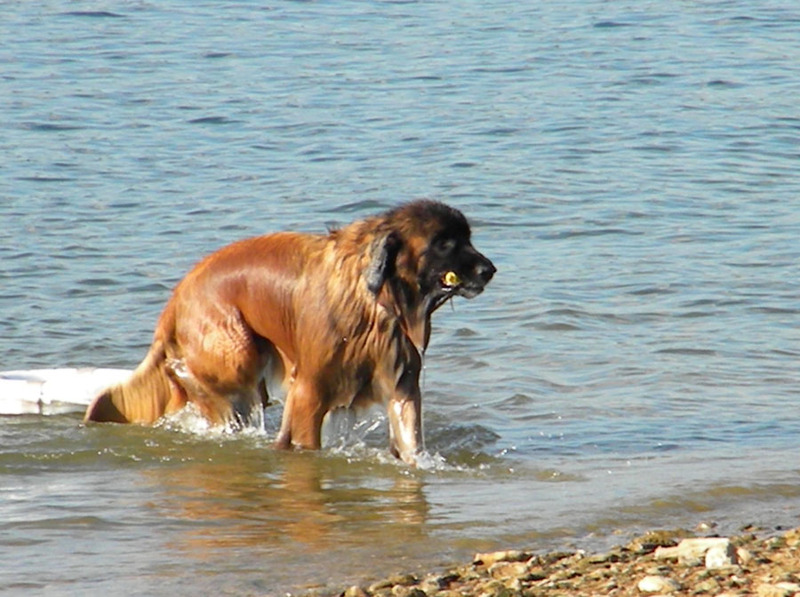 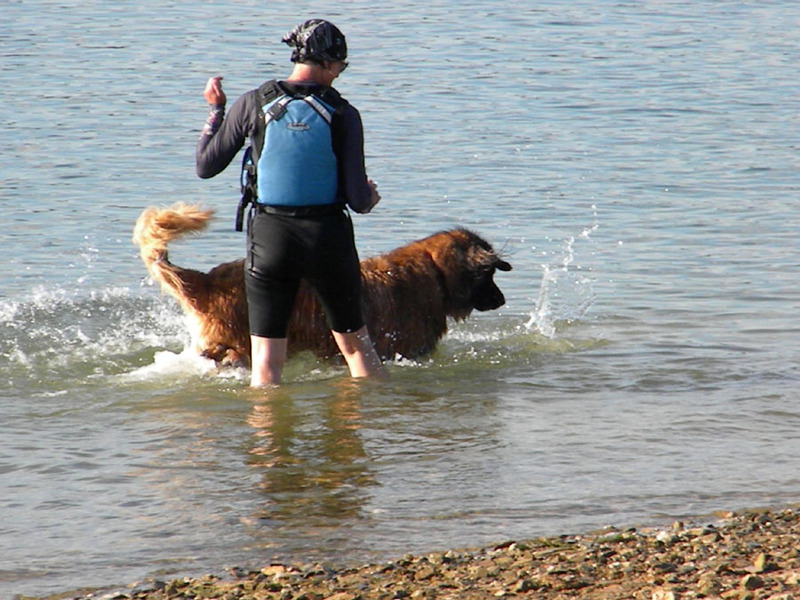 Newfs have ginormous webbed feet, and rather than "doggypaddle" they do something more resembling a powerful breast stroke. 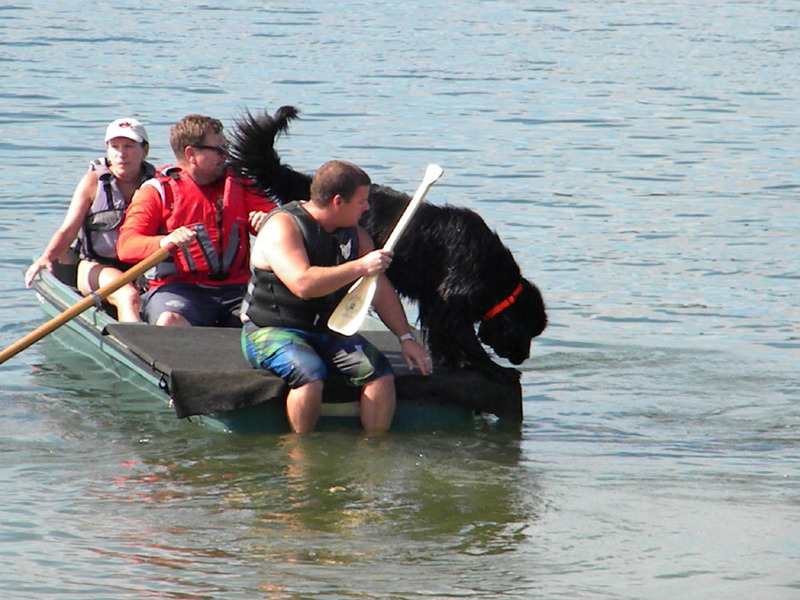 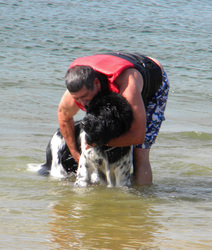 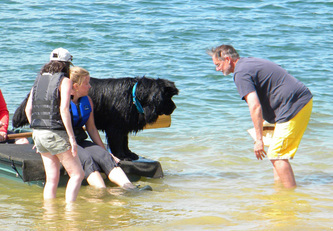 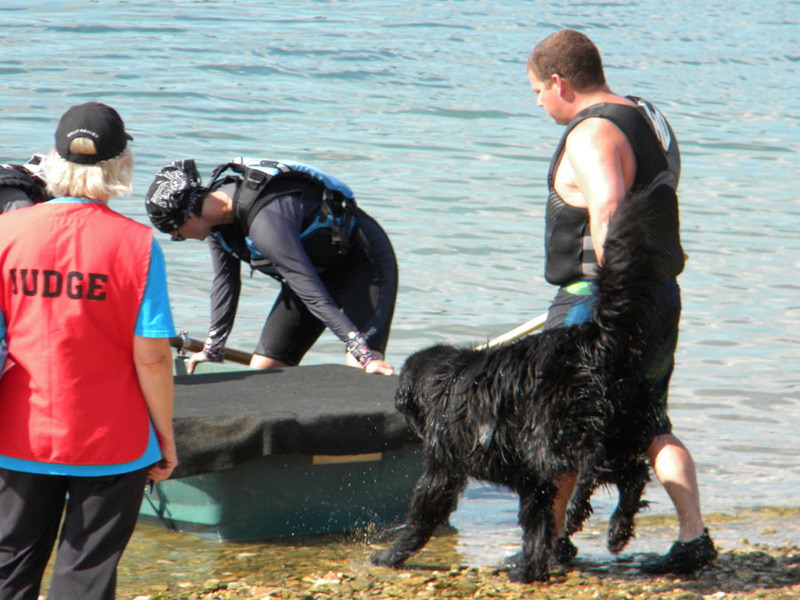 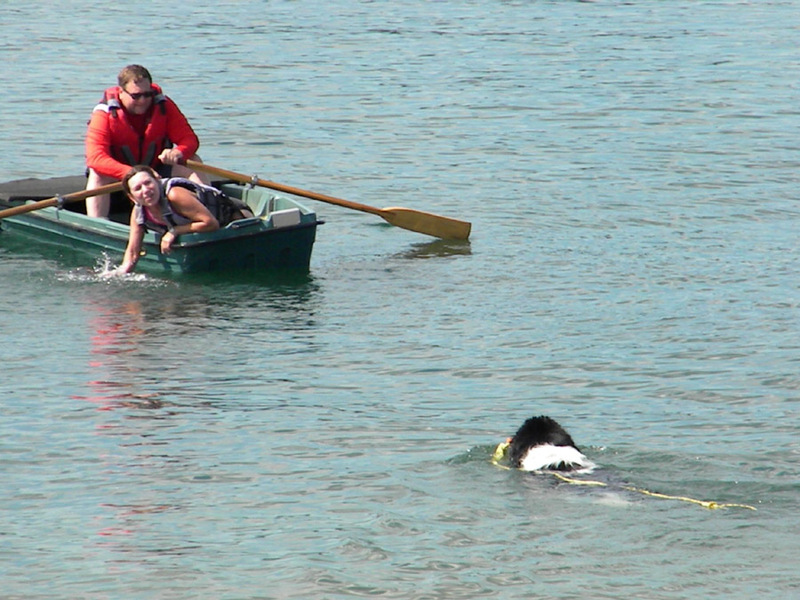 There are many instances on record of Newfies saving lives in water disasters. 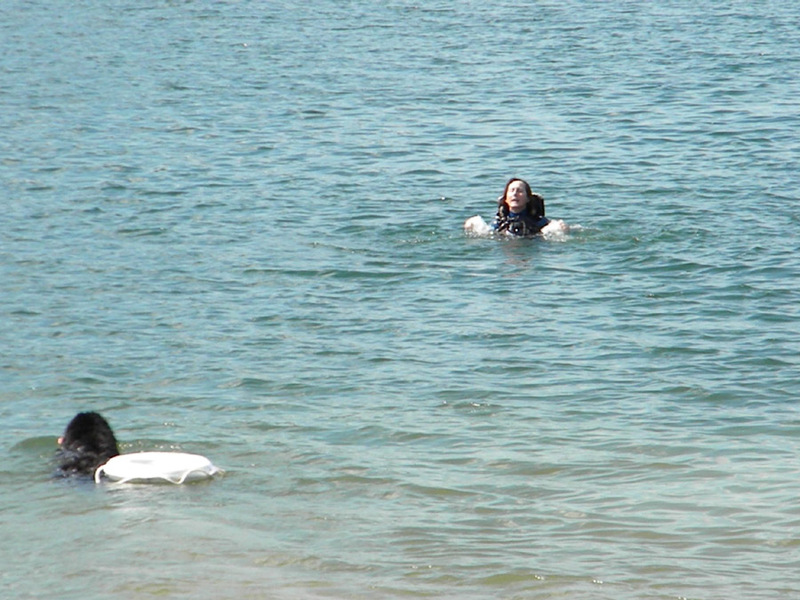 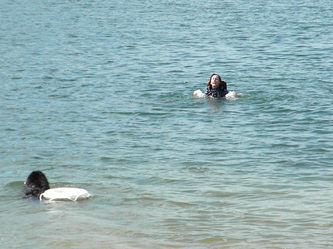 To encourage these lifesaving instincts, in 1971, a group of enthusiasts developed plans for a water trial consisting of 12 exercises, six each in two divisions, junior and senior. 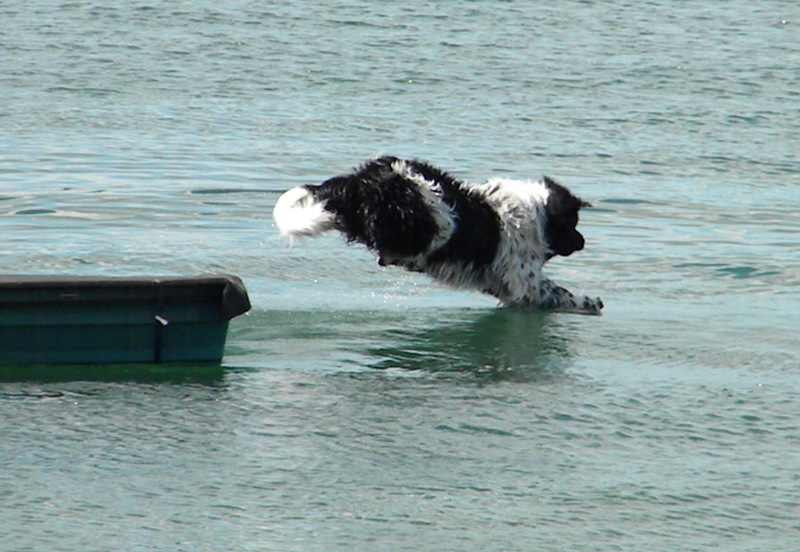 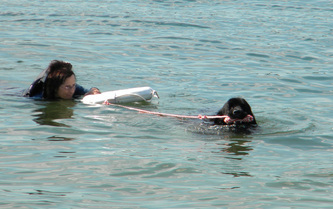 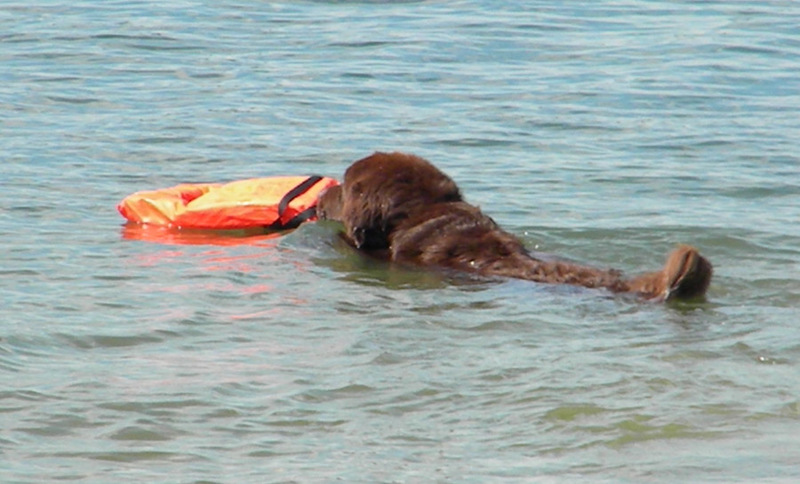 Two years later, the Newfoundland Club of America sanctioned its first official rescue test in Michigan. Over time, the rules have changed, mostly from observing the dog’s natural instincts, but the original concept remains intact. 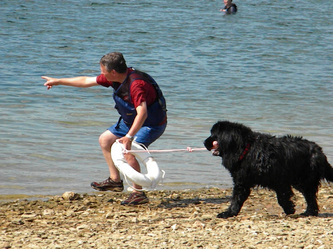 Junior division exercises are fundamental. 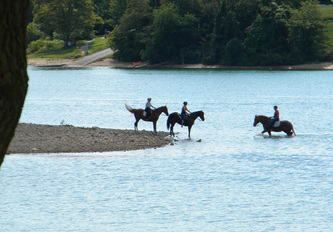 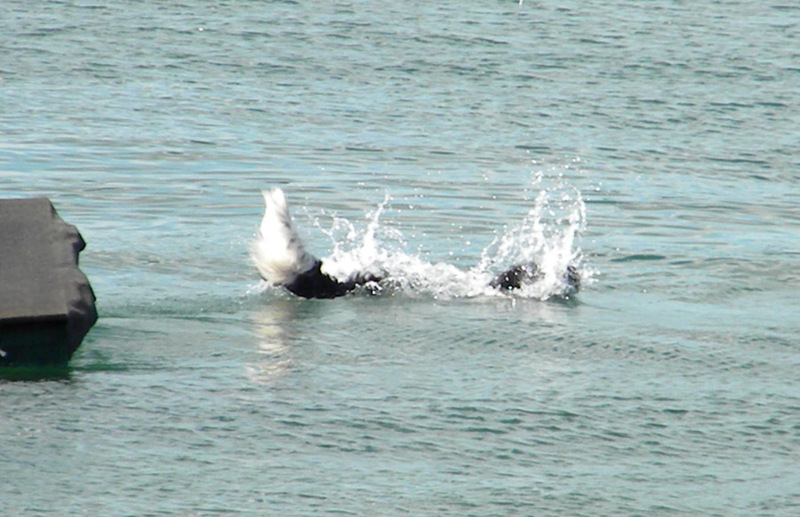 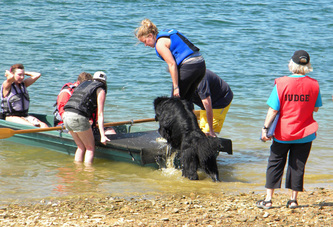 The first one, basic control, takes place on dry land. The dog’s willingness and ability to perform its owner’s bidding are tested with heeling, a recall, and a down stay. 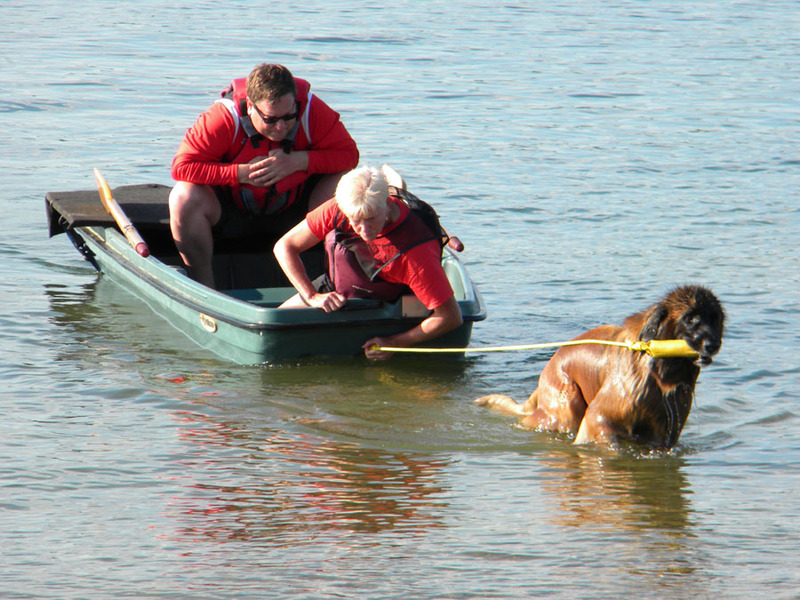 The five remaining exercises are performed in the water and consist of retrieving a bumper, retrieving a life jacket or cushion, delivering a rope to a swimming steward, towing a boat, and swimming calmly with a handler. 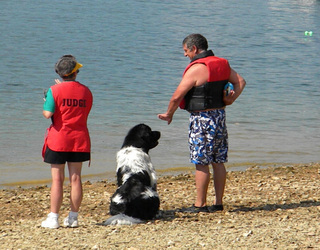 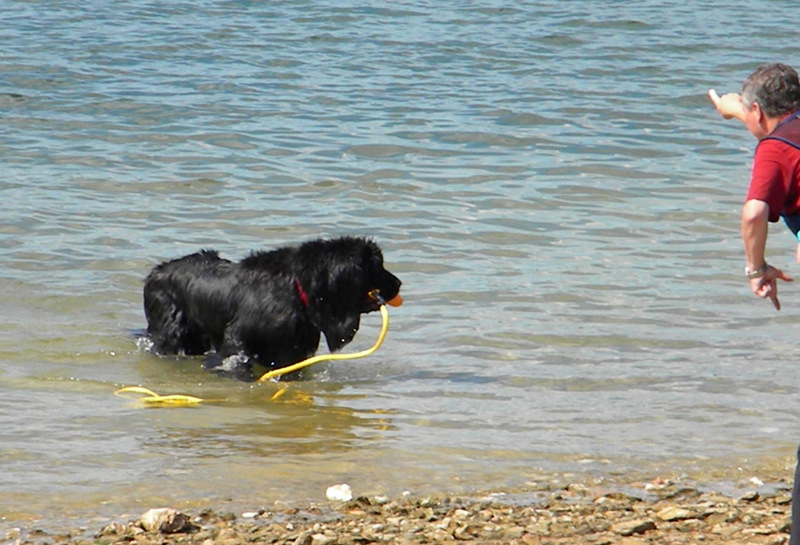 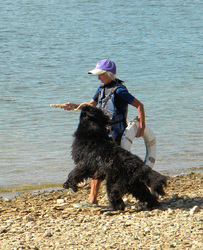 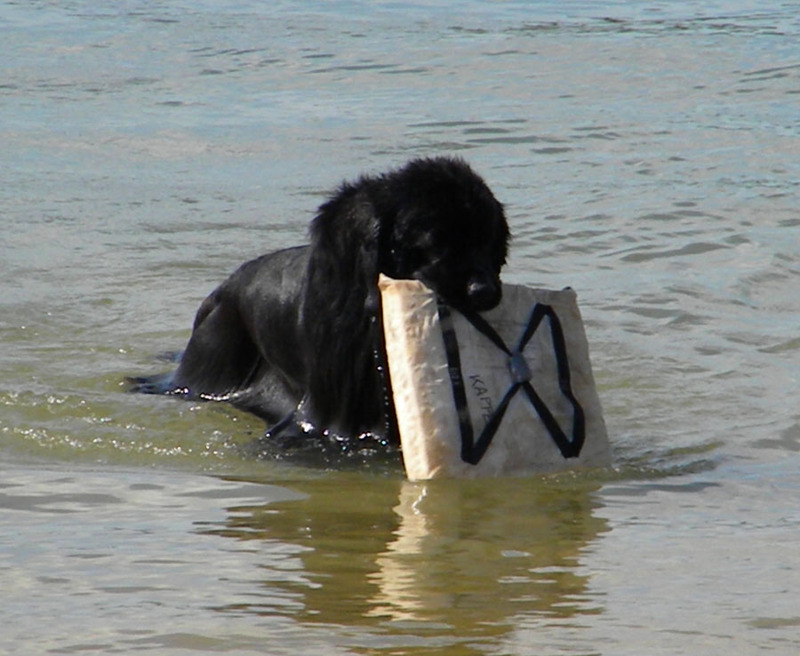 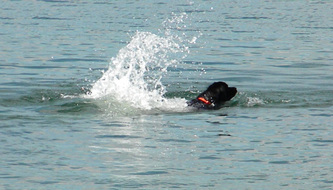 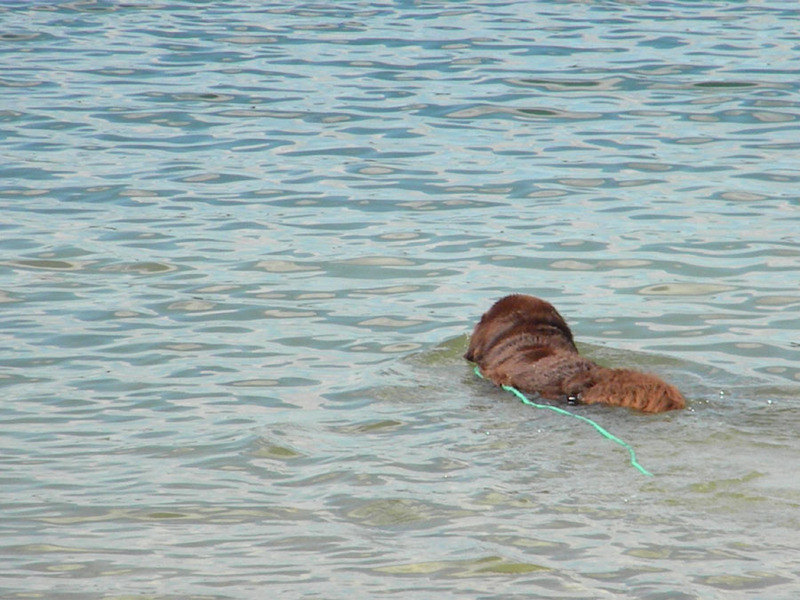 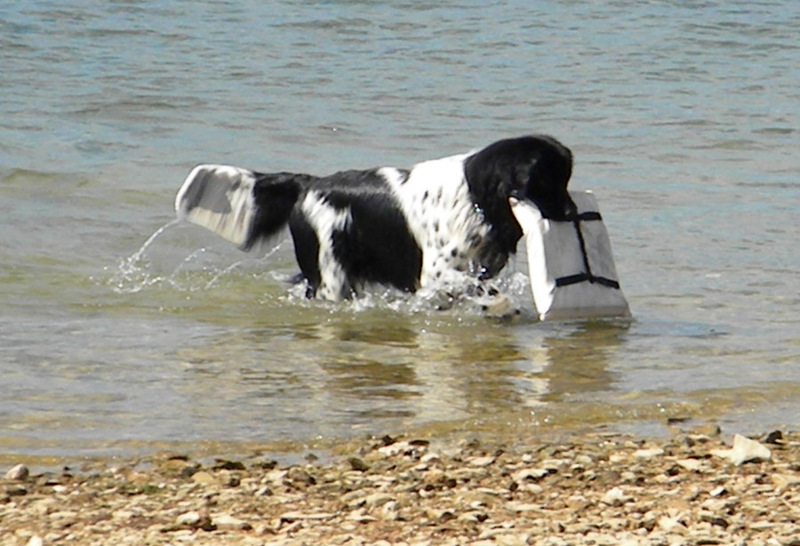 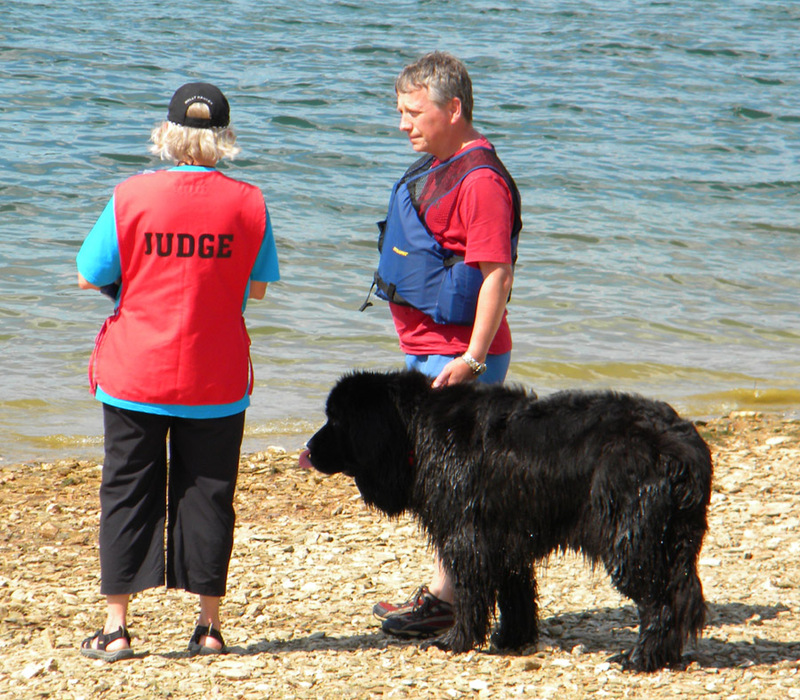 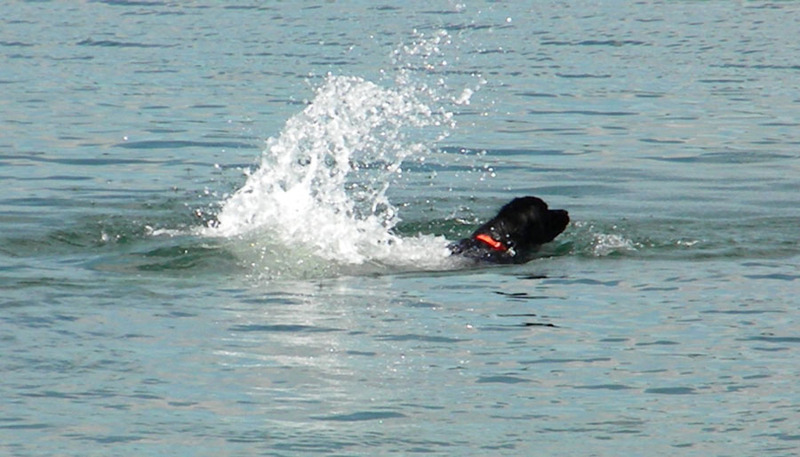 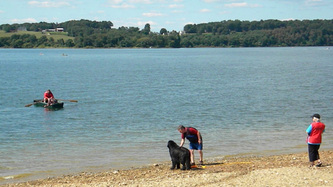 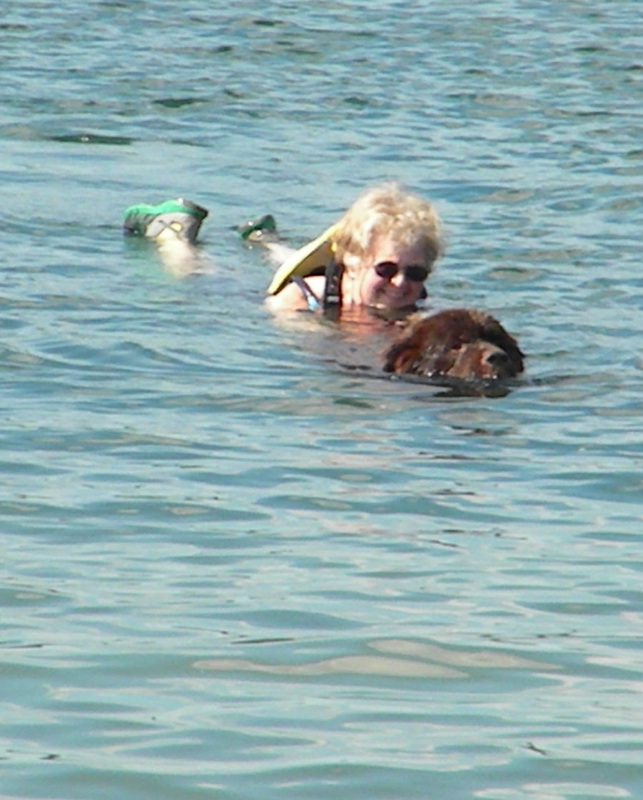 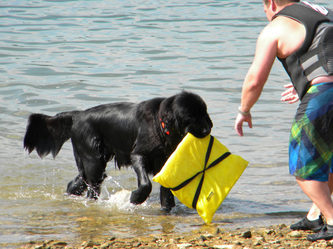 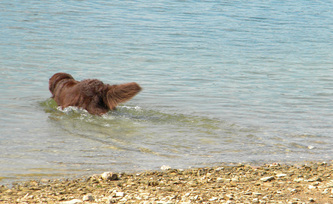 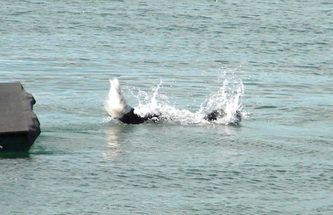 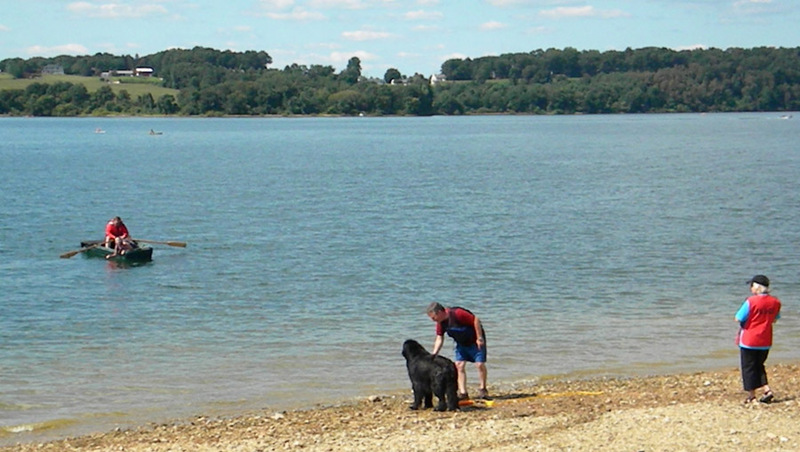 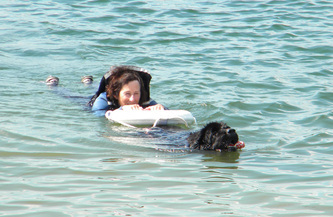 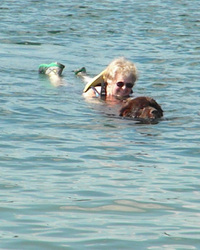 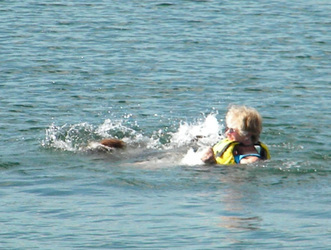 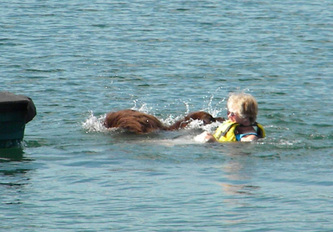 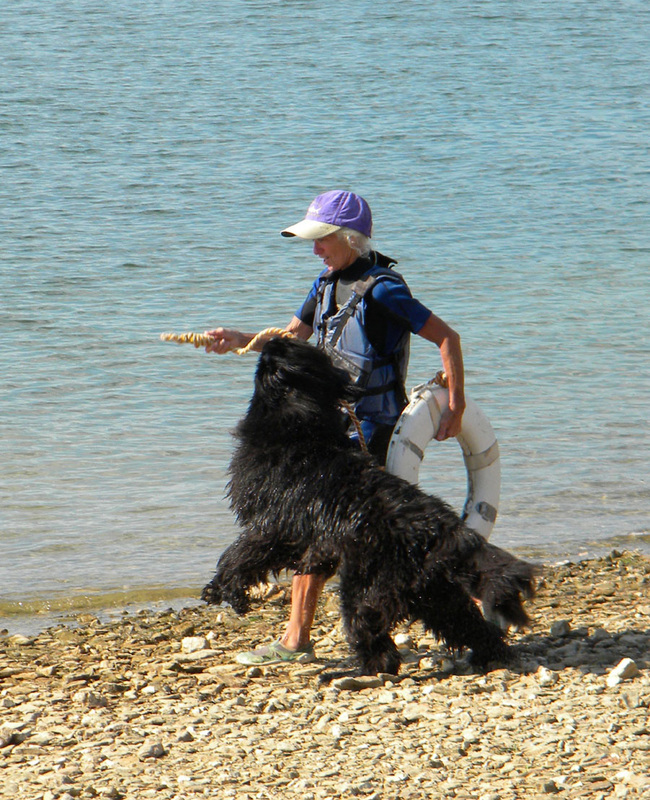 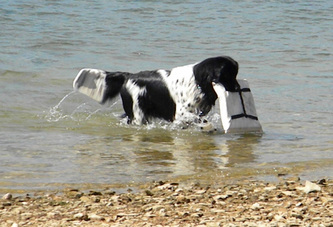 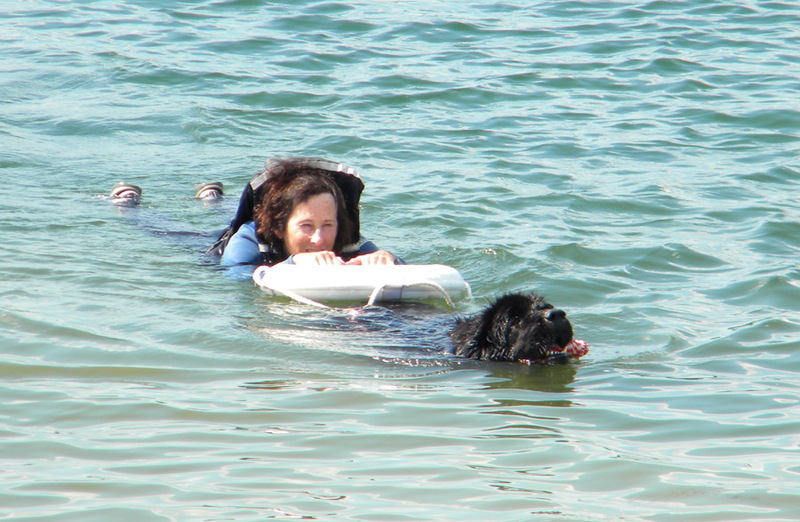 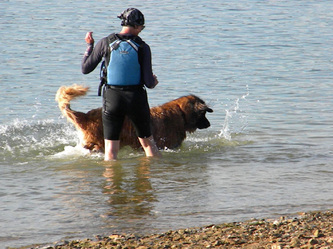 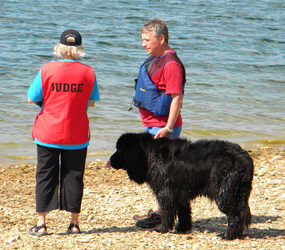 Accomplishing all six tasks results in a Water Dog title, issued by the NCA. 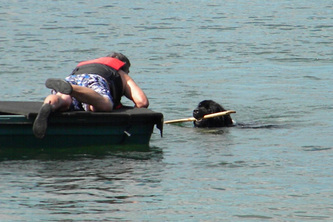 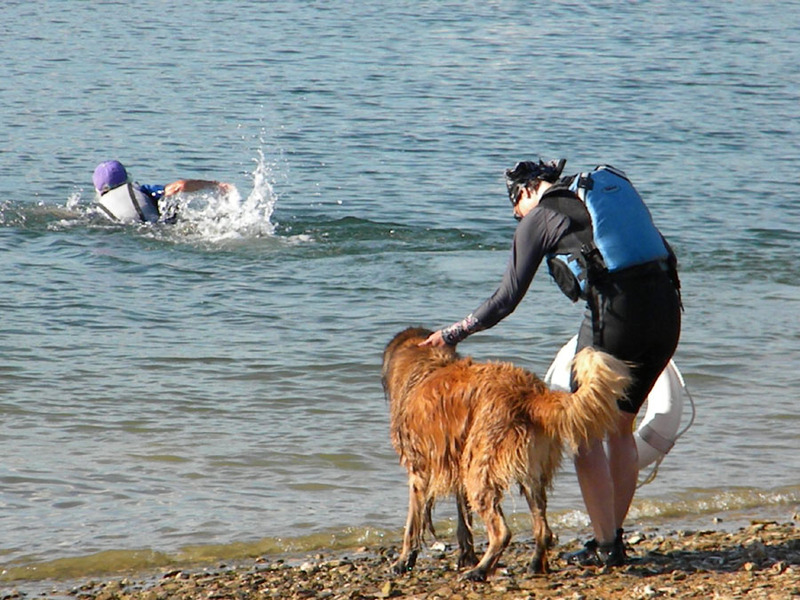 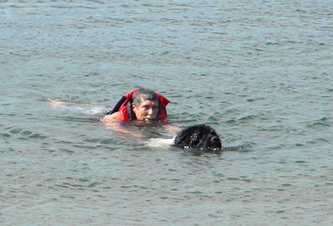 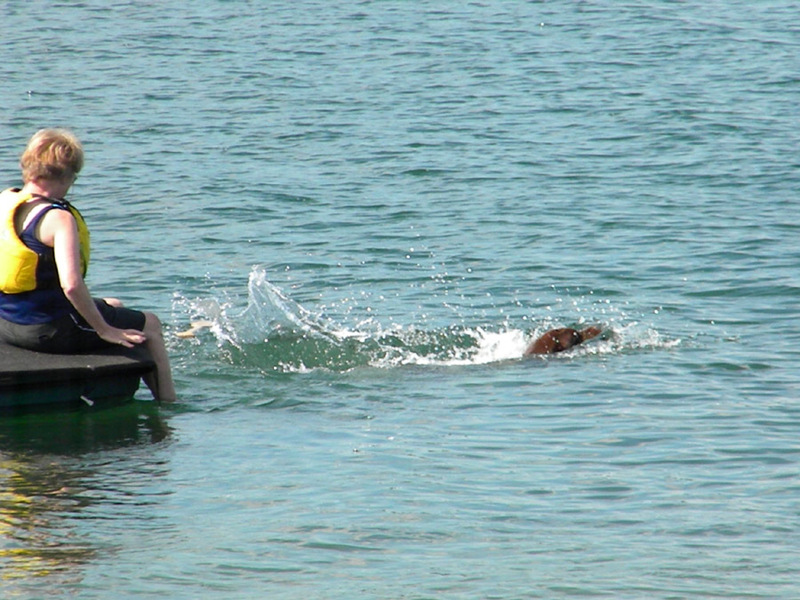 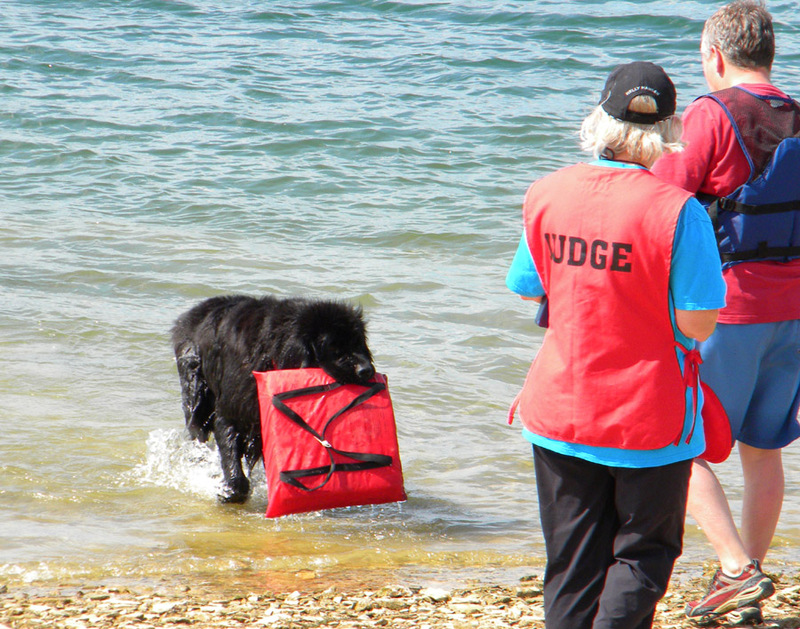 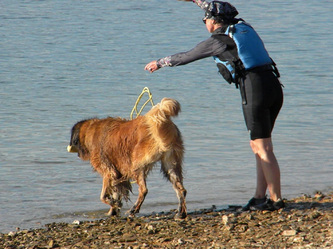 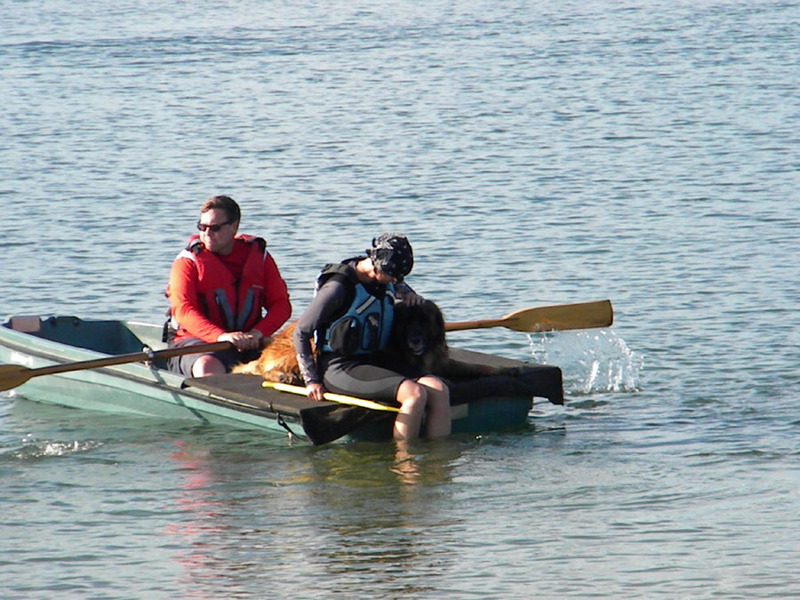 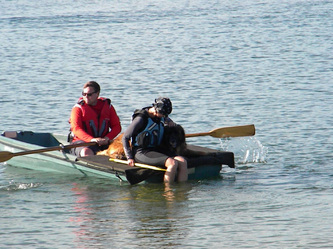 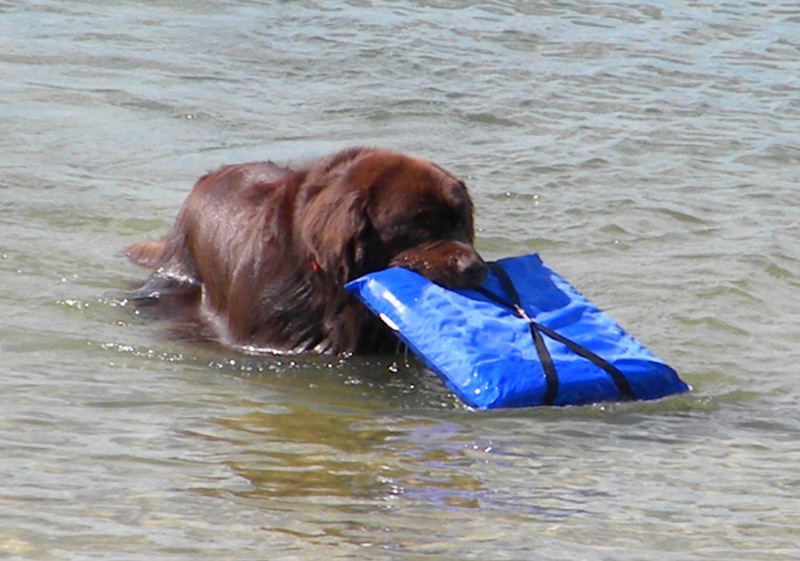 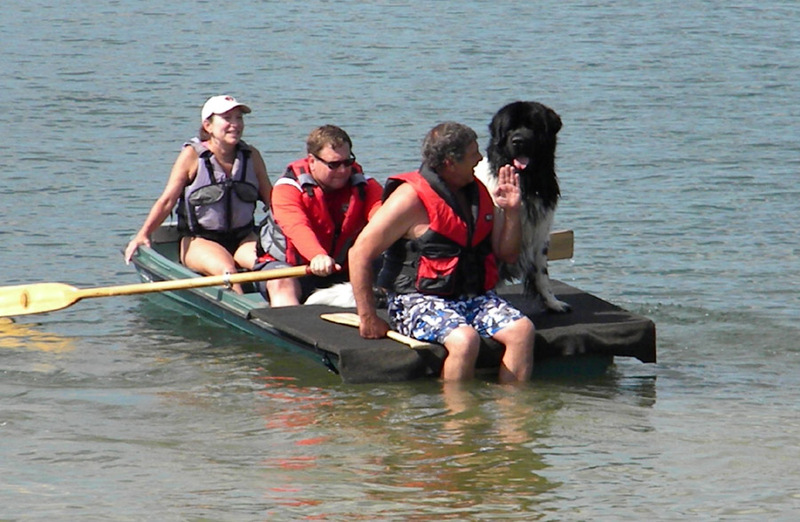 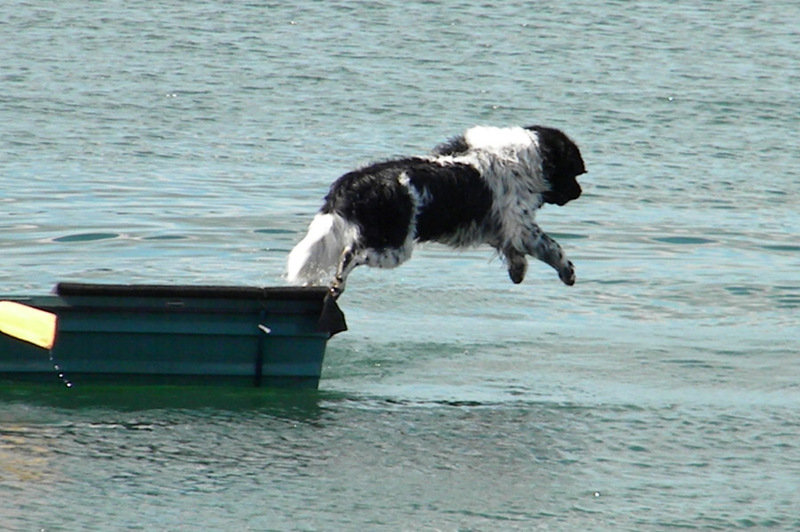 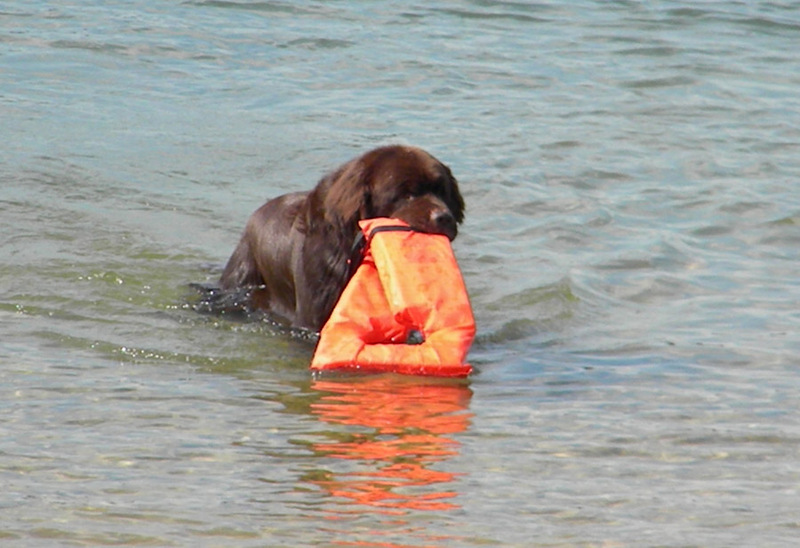 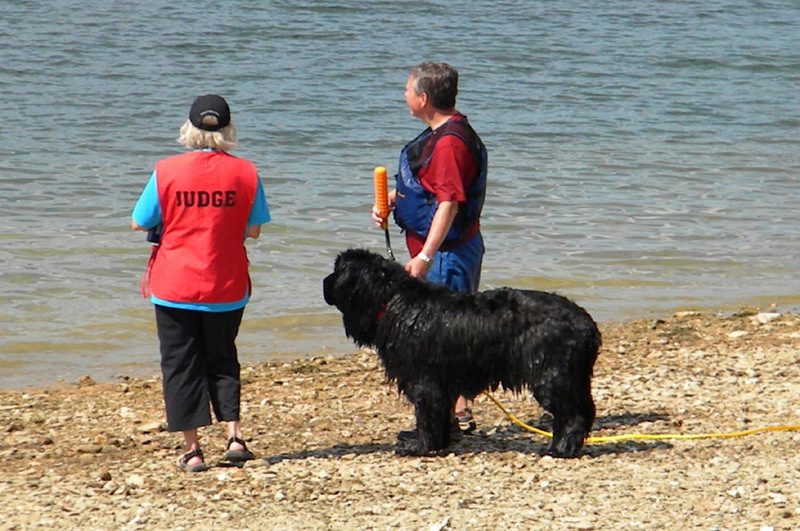 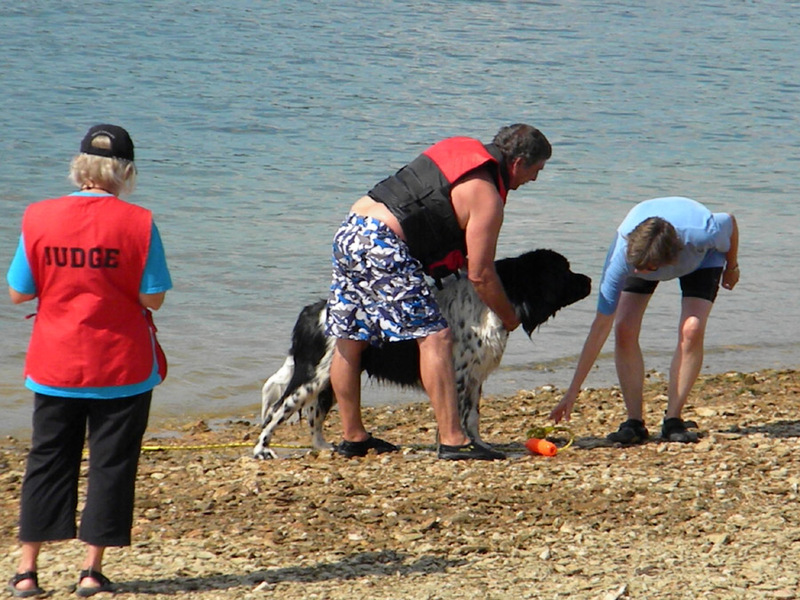 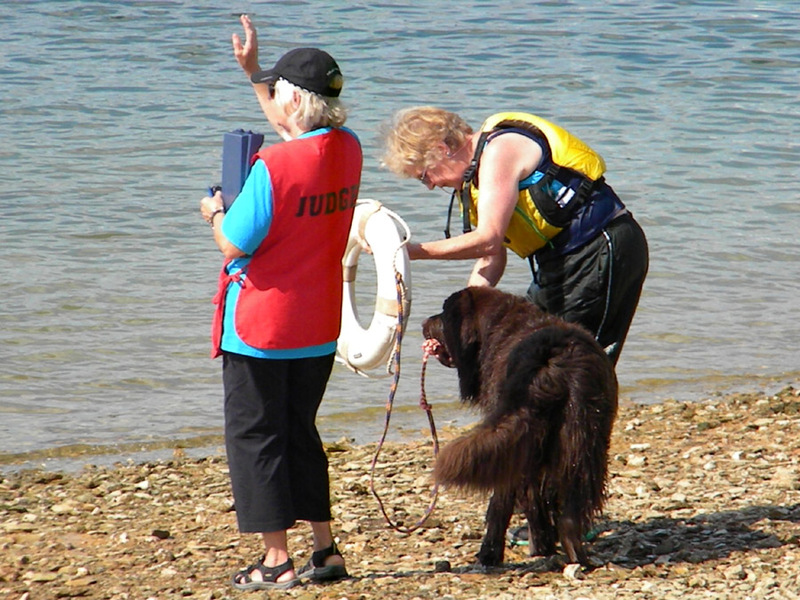 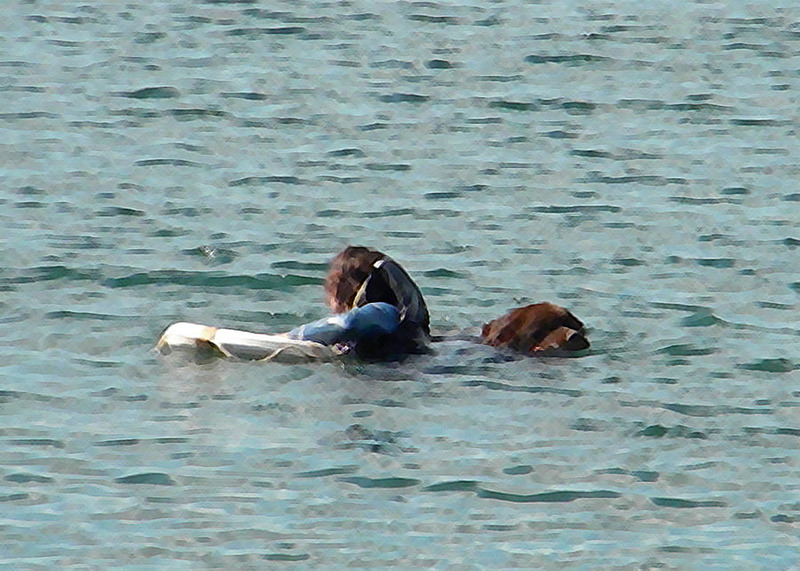 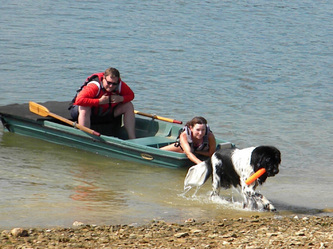 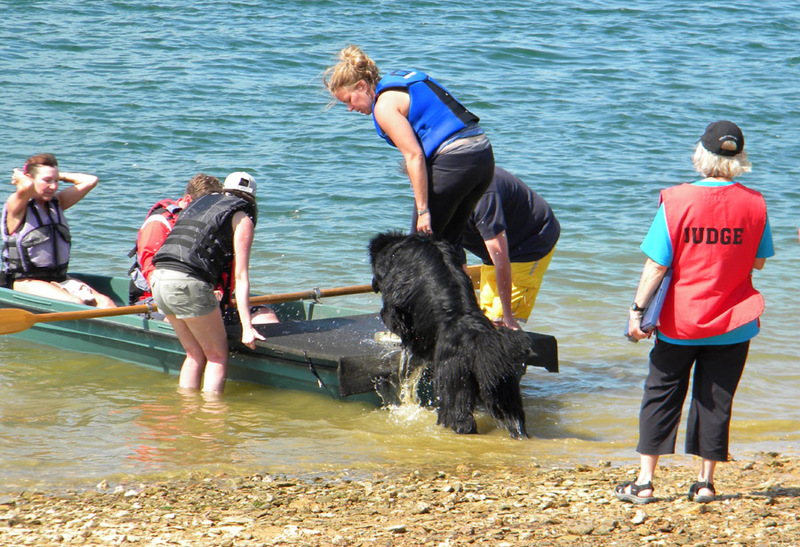 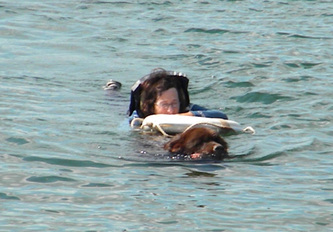 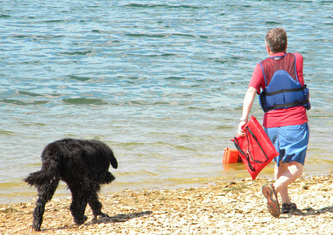 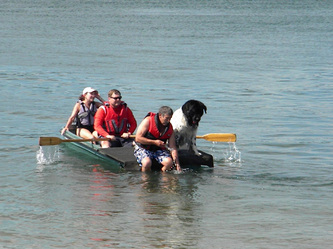 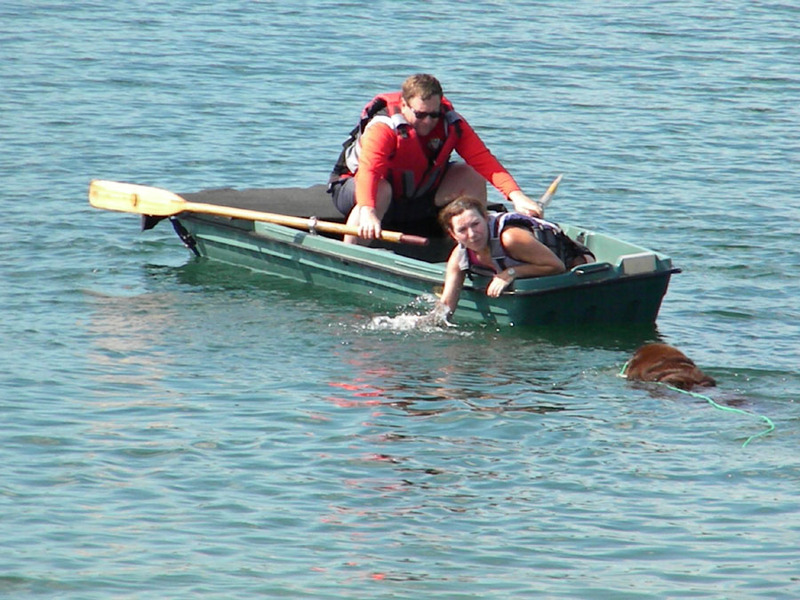 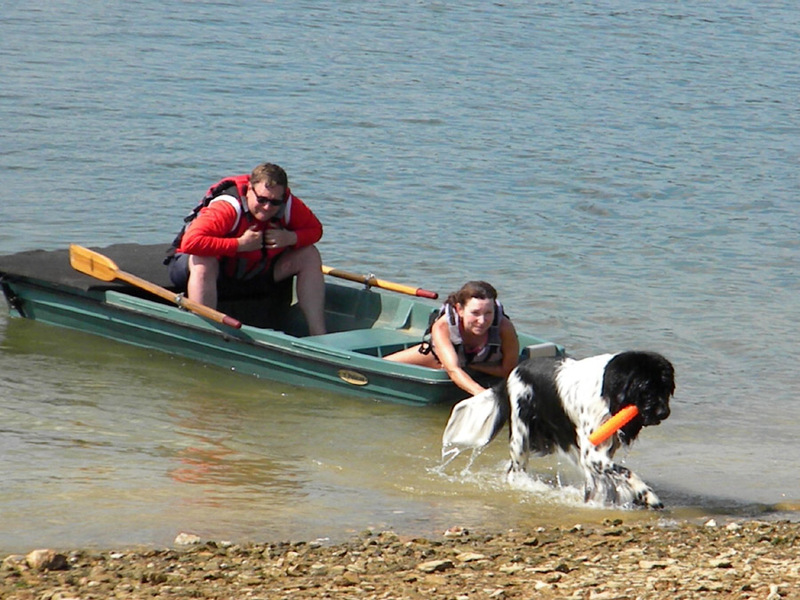 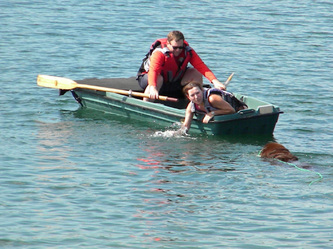 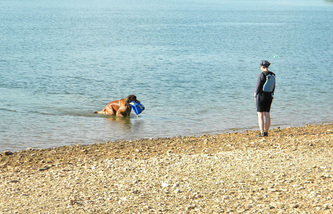 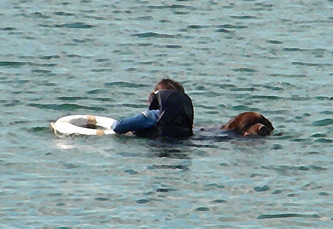 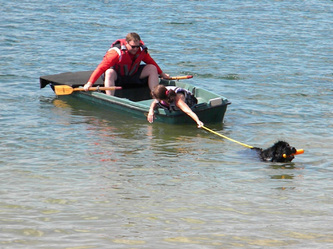 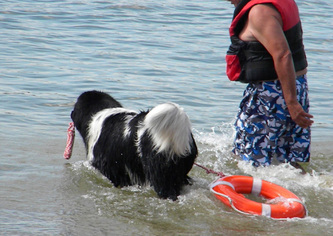 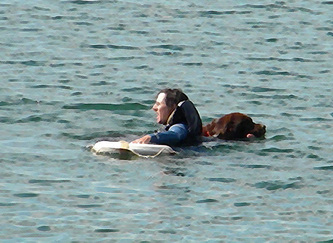 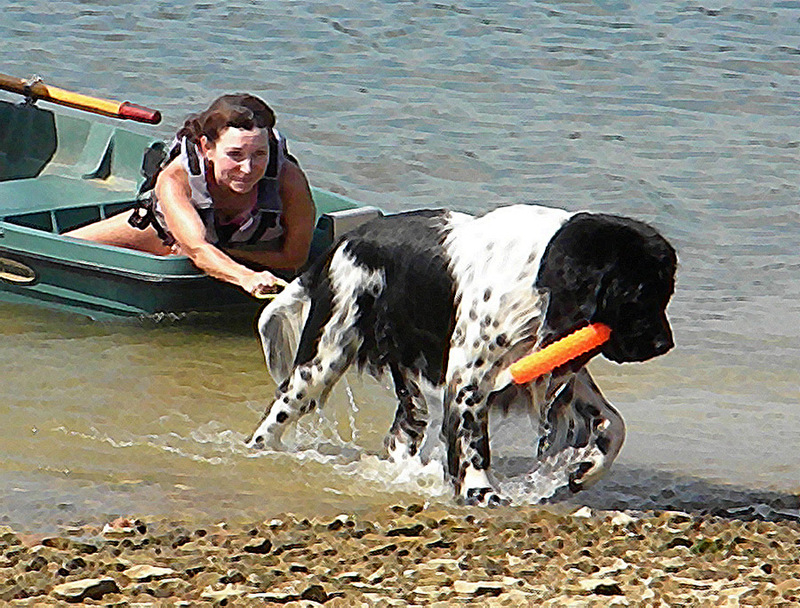 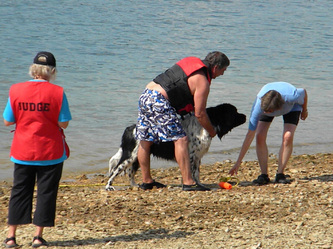 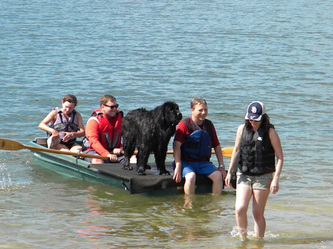 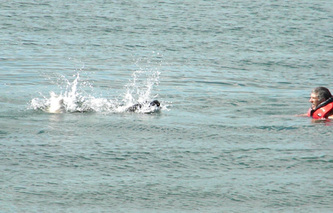 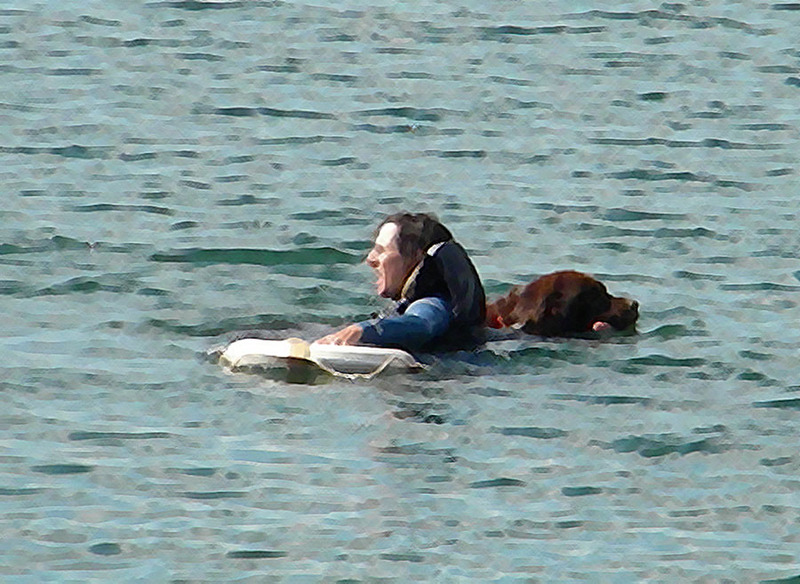 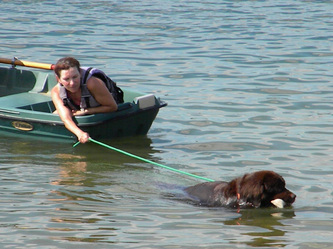 In the senior division, the dog must retrieve two articles in the proper order, leap from a boat to fetch a paddle, discriminate between three swimmers and then carry a life ring to the one in distress, retrieve underwater, carry a line from shore to a steward in a boat and then tow that boat to shore, and leap from a boat to save its handler, who has “fallen” overboard. 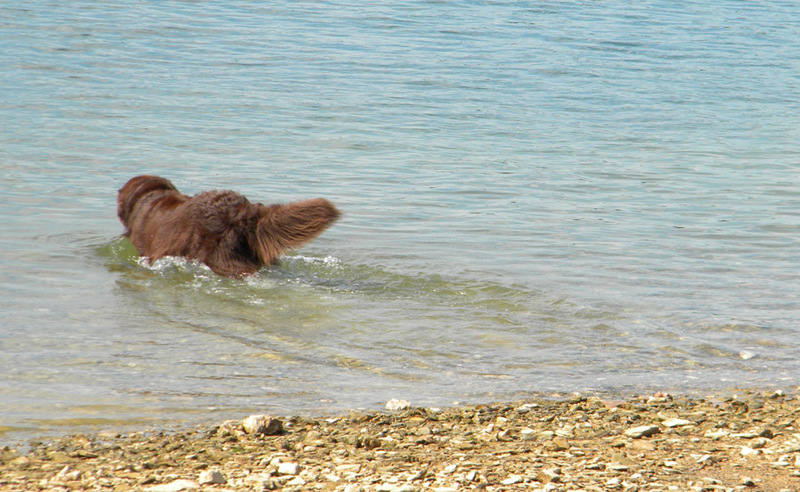 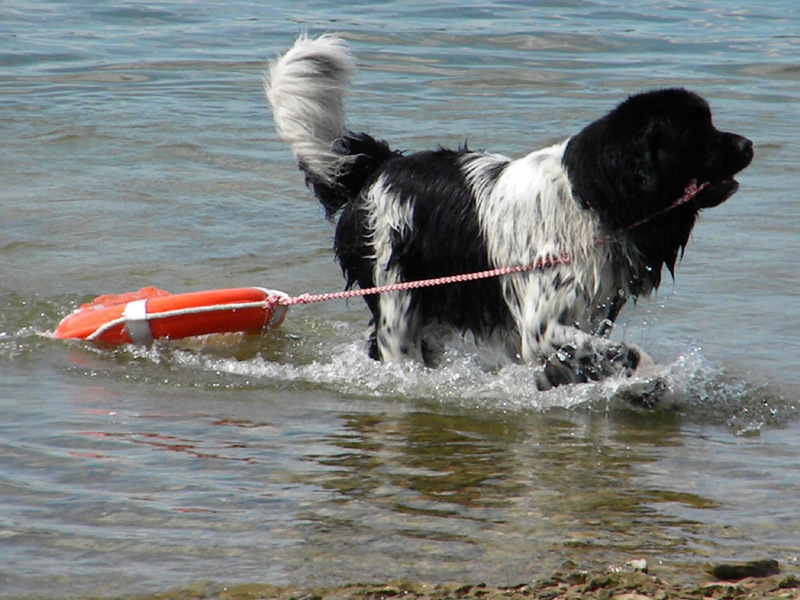 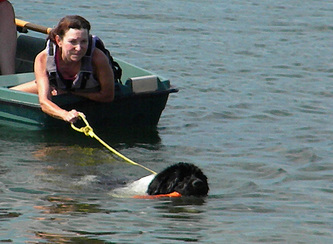 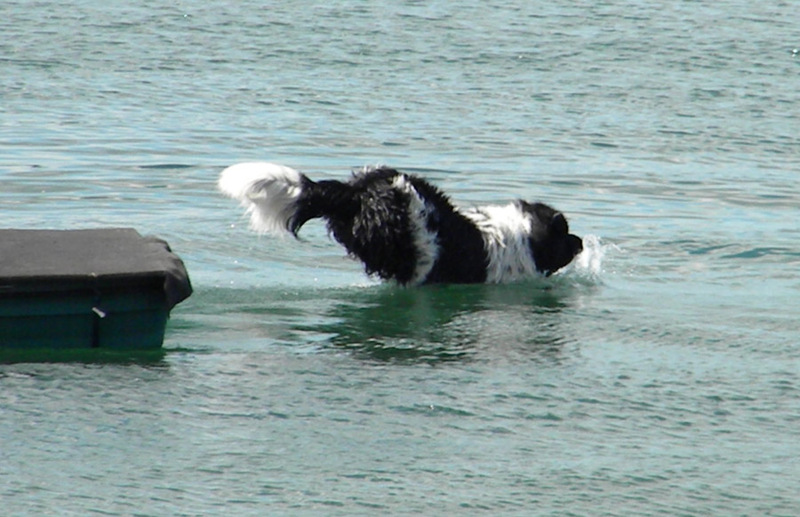 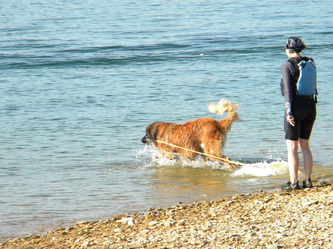 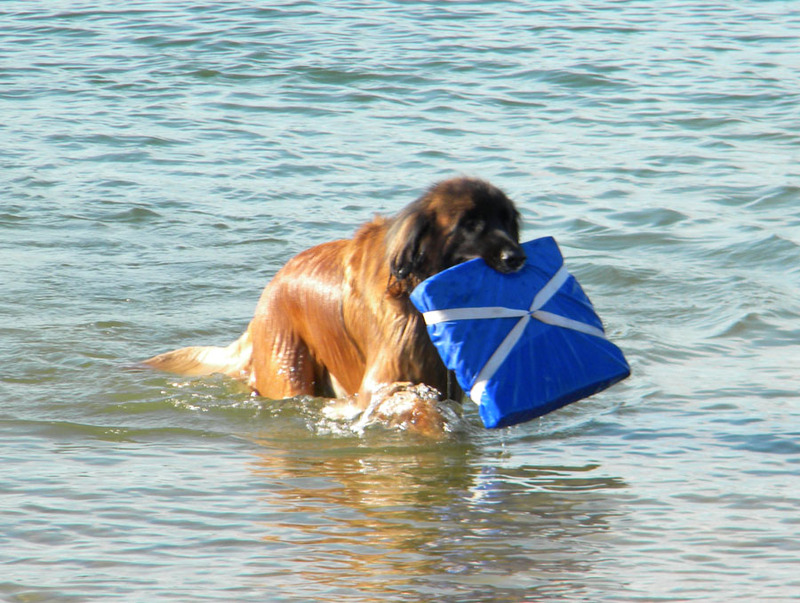 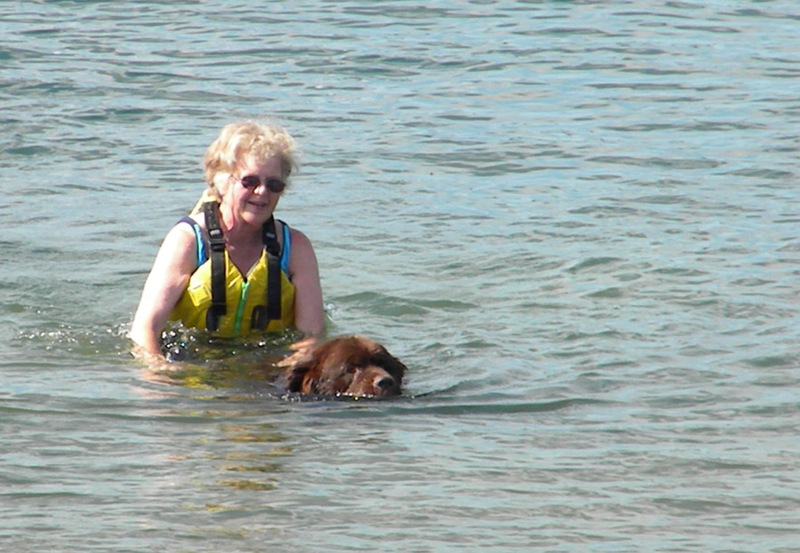 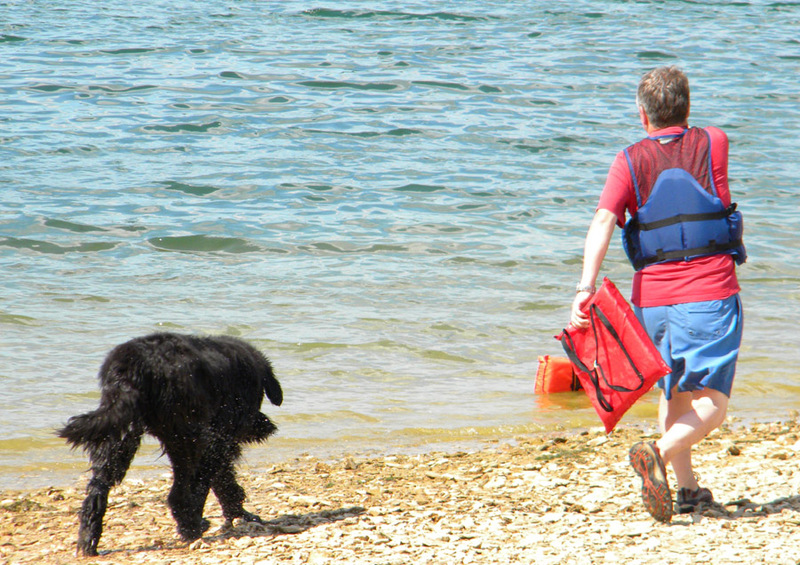 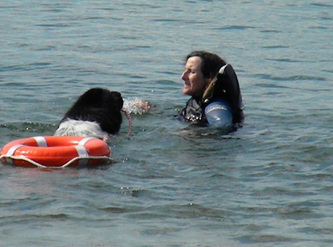 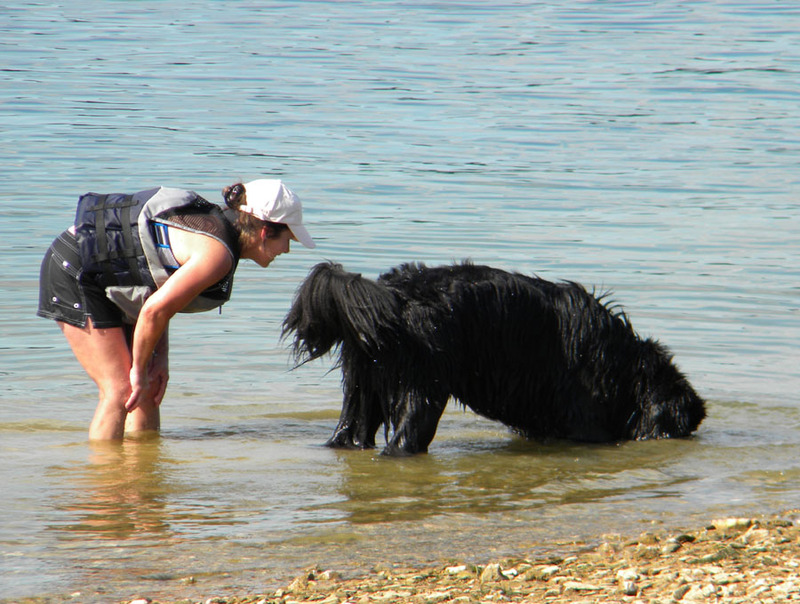 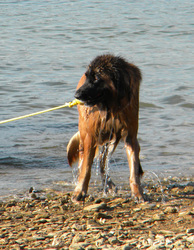 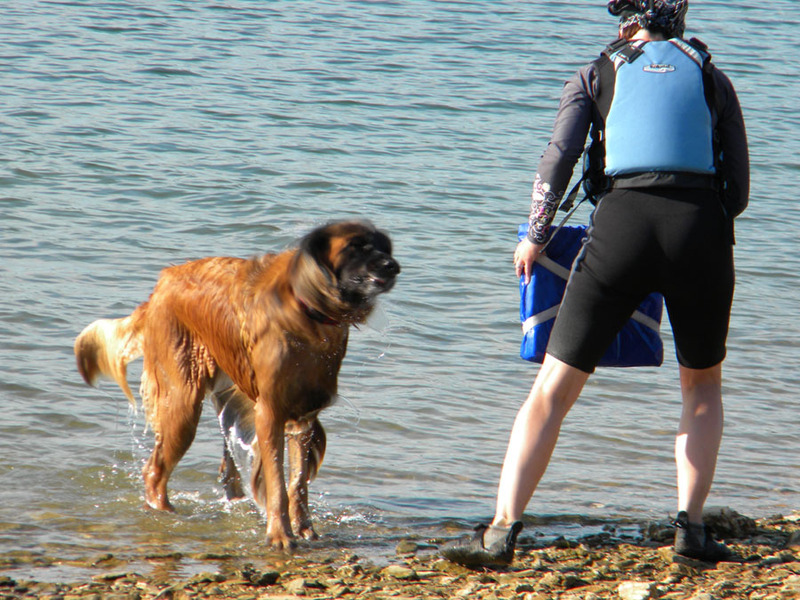 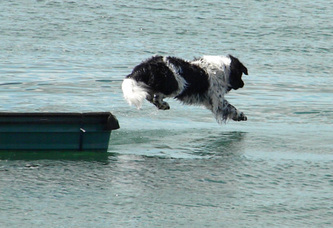 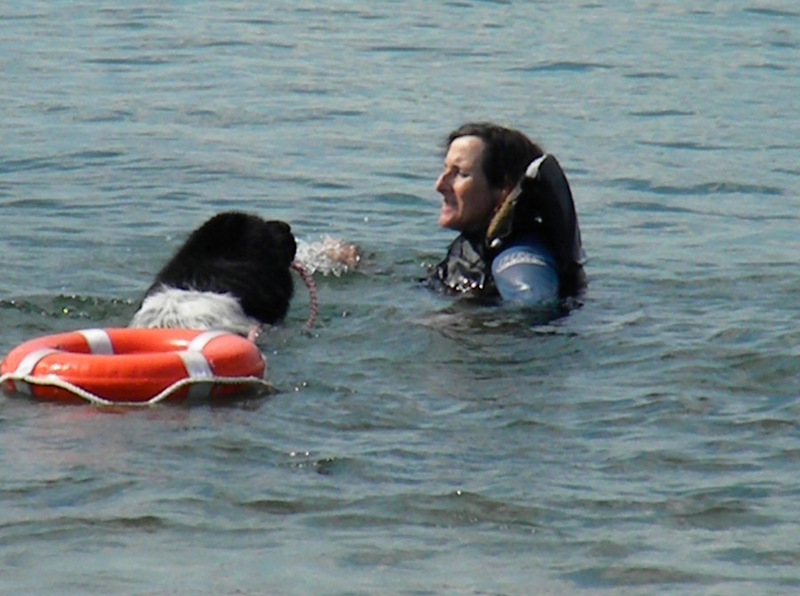 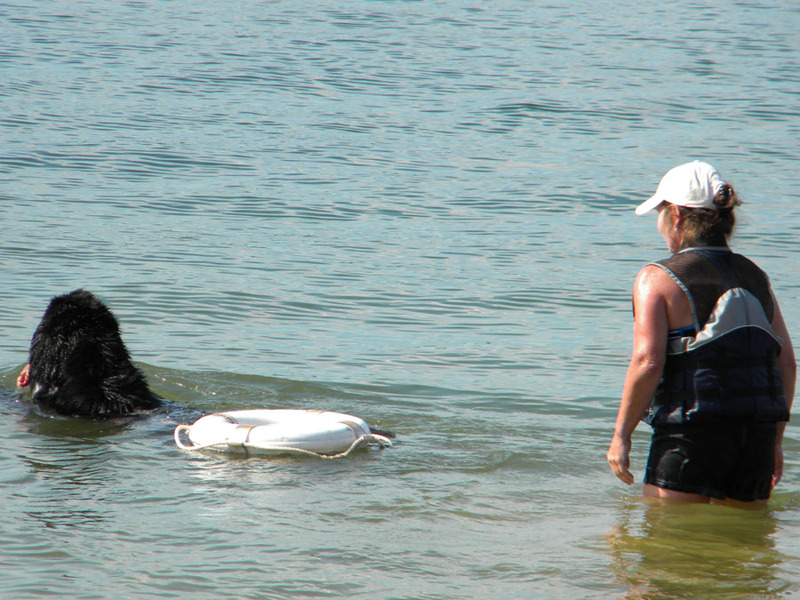 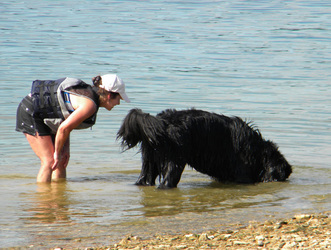 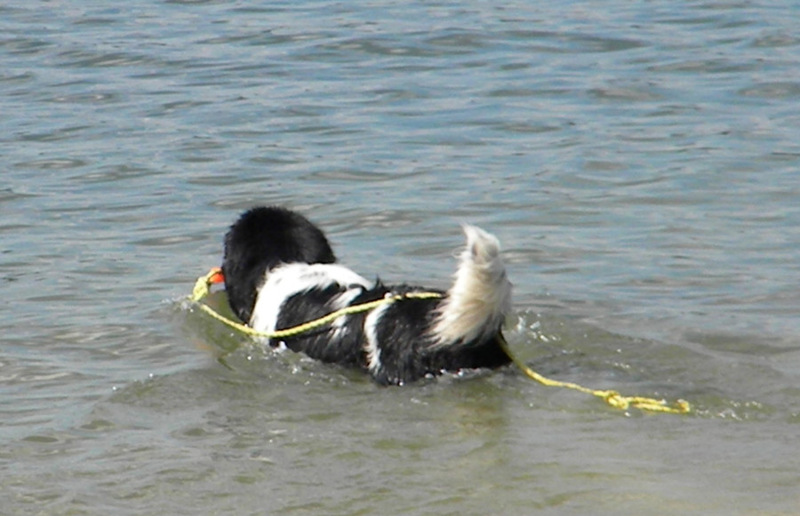 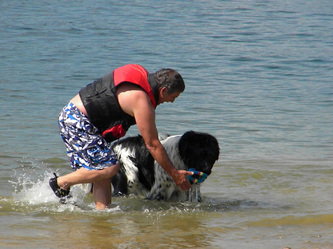 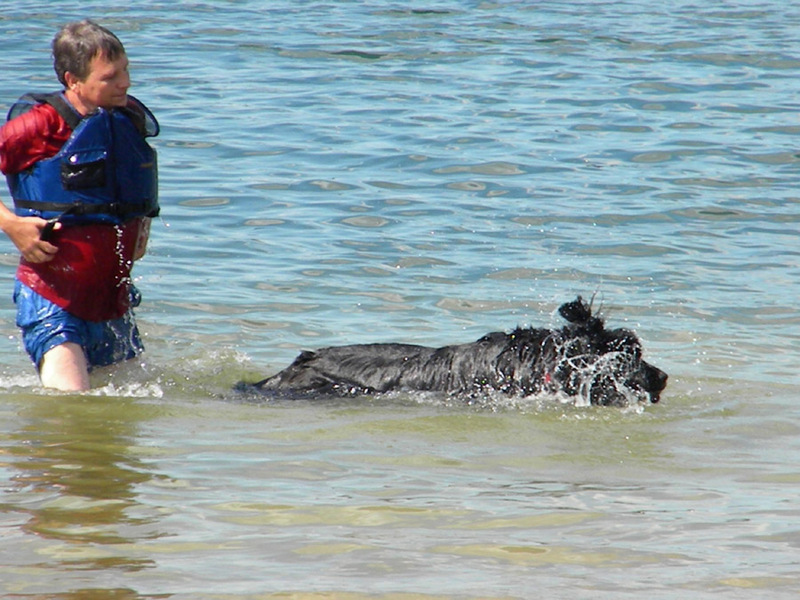 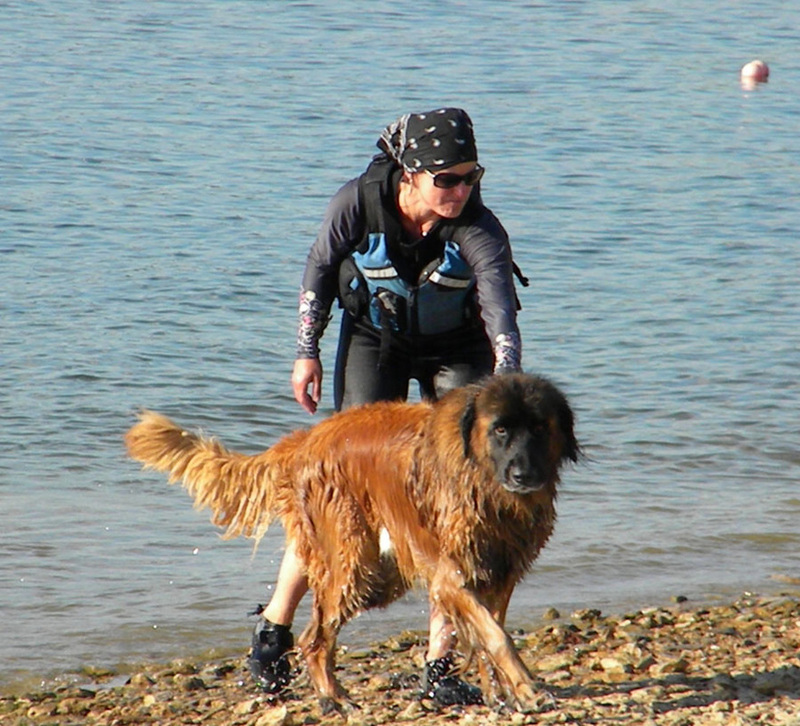 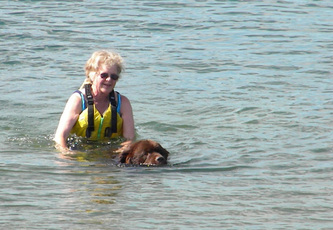 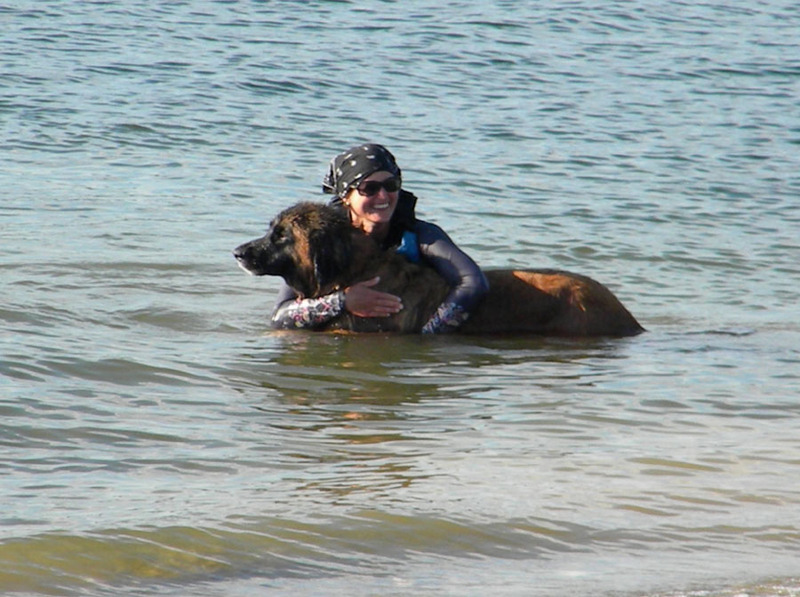 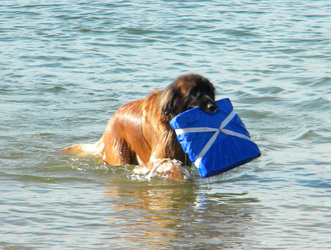 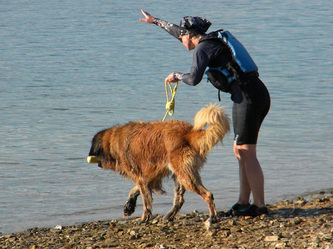 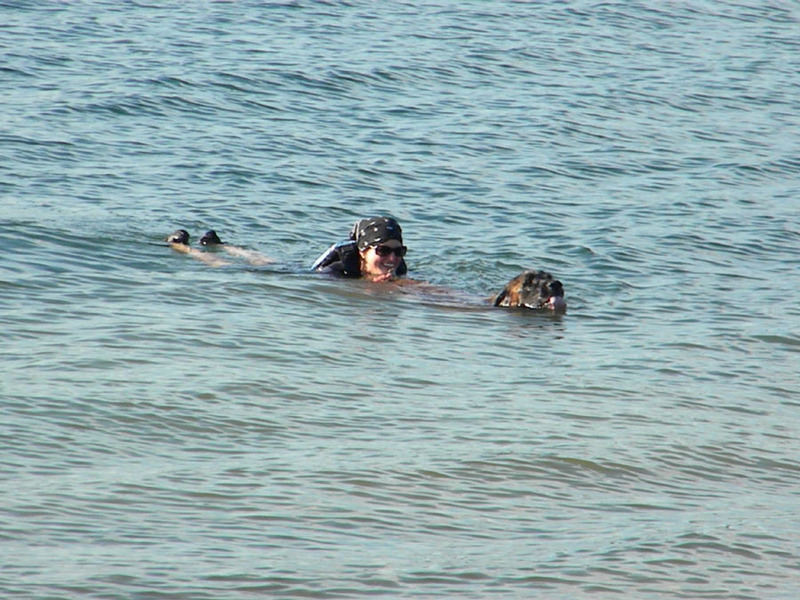 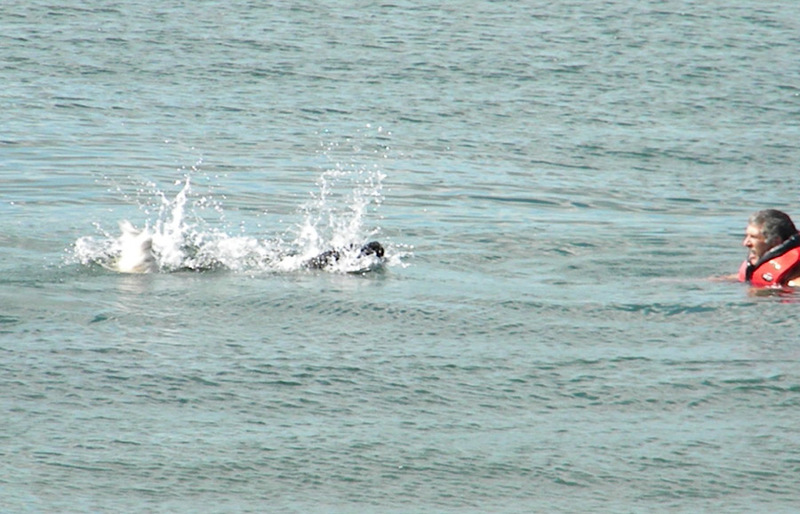 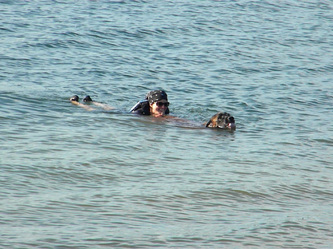 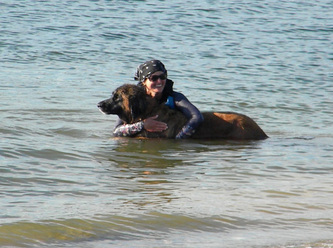 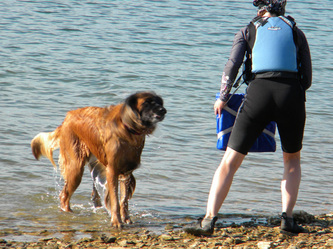 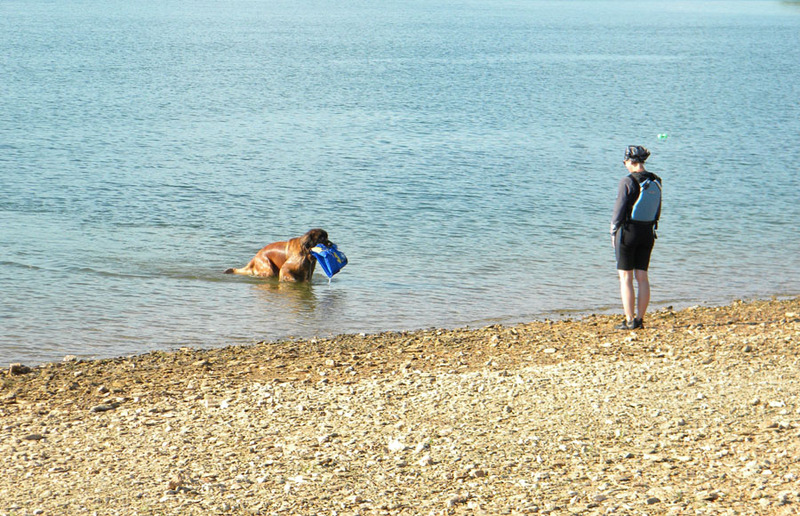 A dog that passes these six exercises adds the title of Water Rescue Dog to its name. 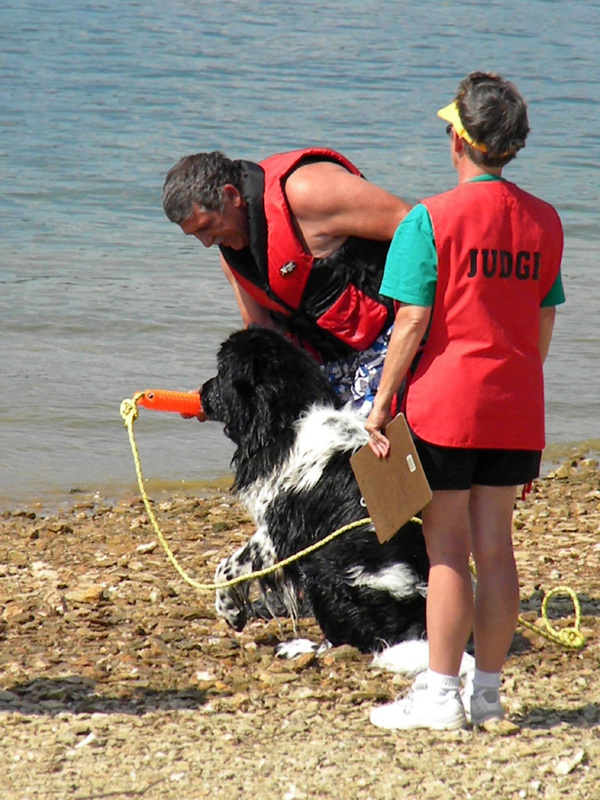 Created over the past 3 years by the Working Dog Committee of the NCA, the newest division is Water Rescue Dog Excellent, or WRDX. This test is for the elite working dog, who shows a drive and stamina and instinctive working ability beyond most Newfoundlands. 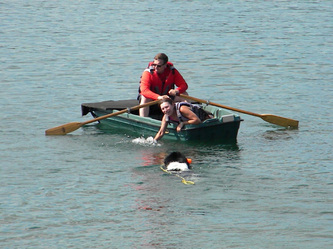 The six exercises consist of searching for an abandoned boat, and returning it to land; rescuing multiple victims from the side of a boat; rescue of an unconscious victim; a rescue of a victim under a capsized boat; delivering a line to shore from a stranded boat; and taking a line to mulitple drowning victims. 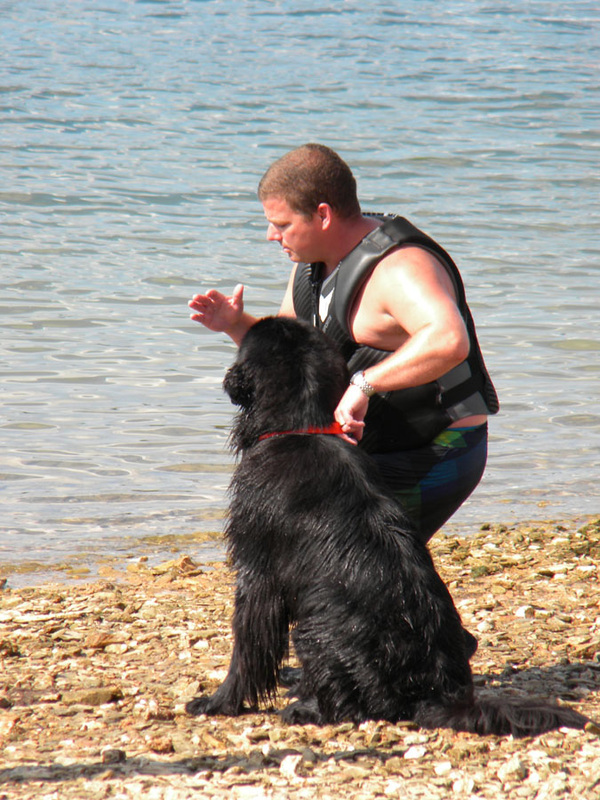 Dogs who complete all 6 exercises earn the title ofWRDX.